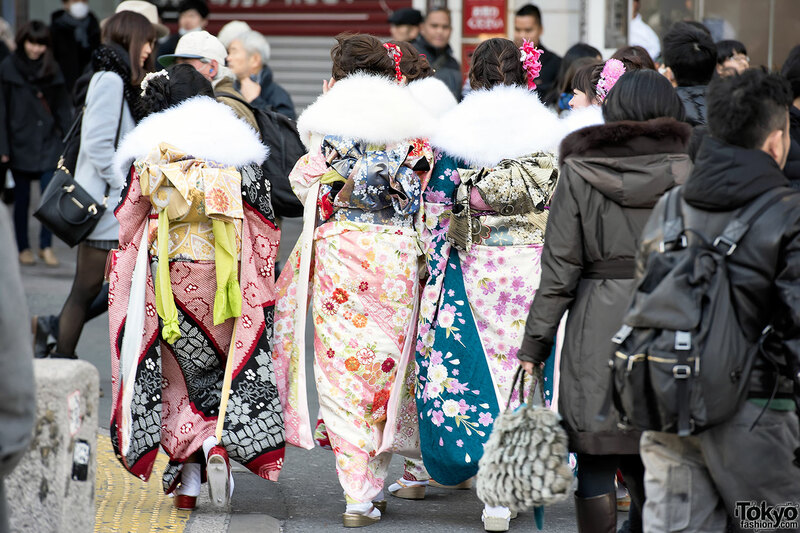 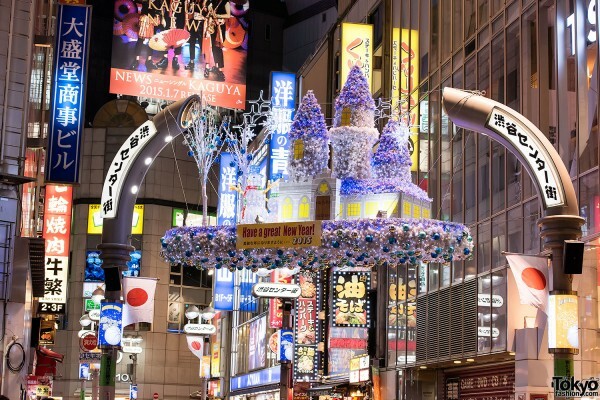 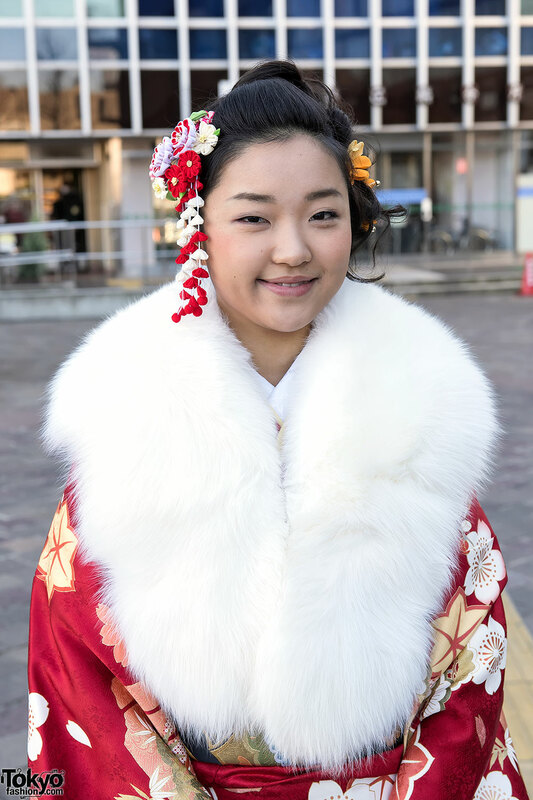 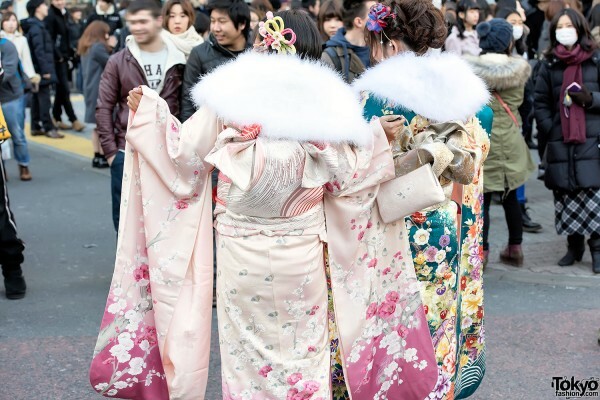 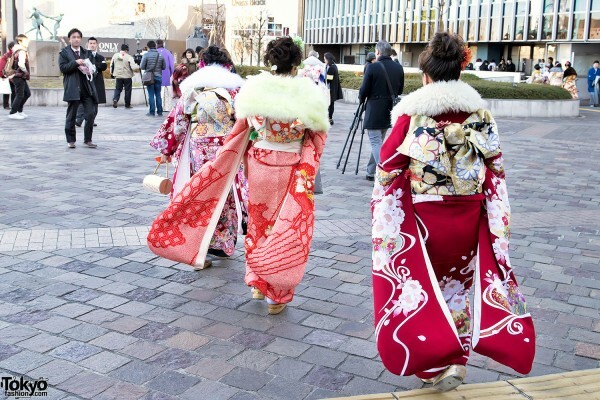 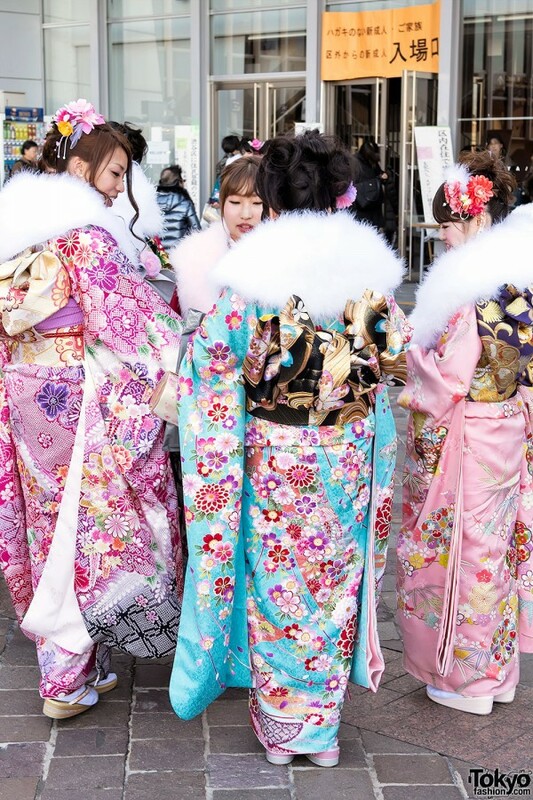 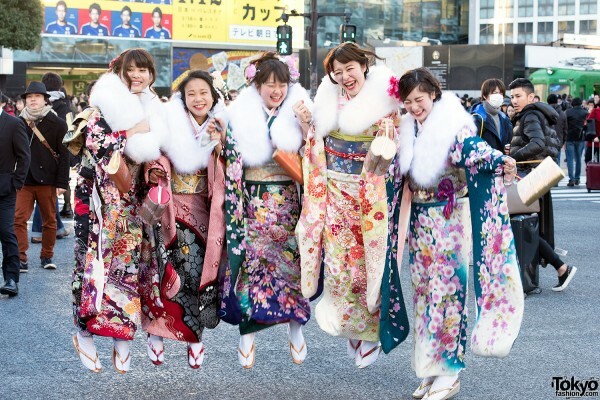 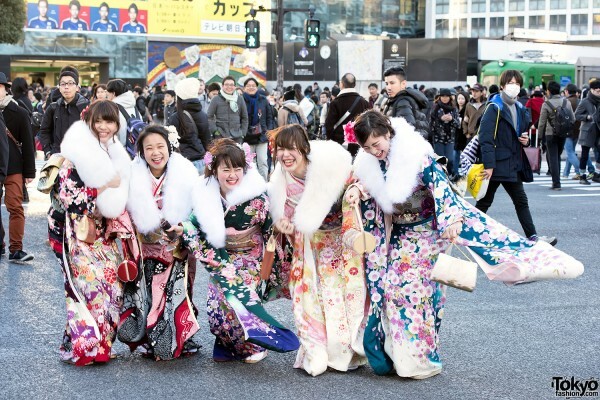 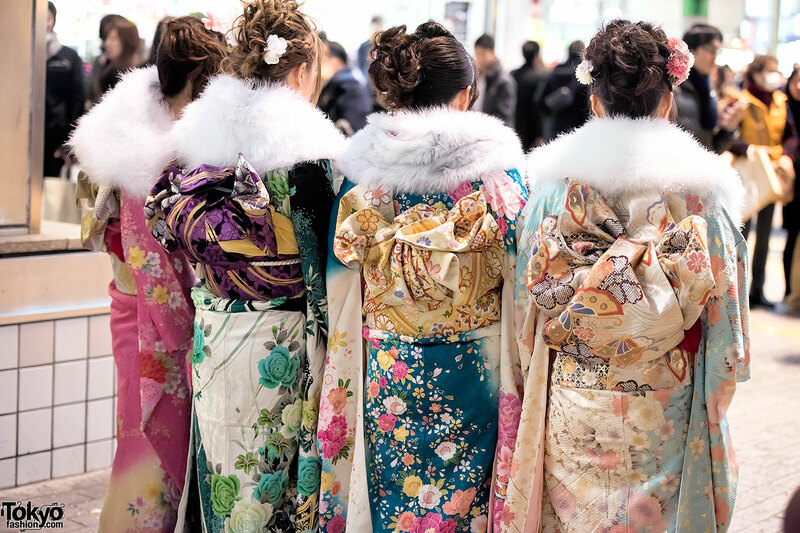 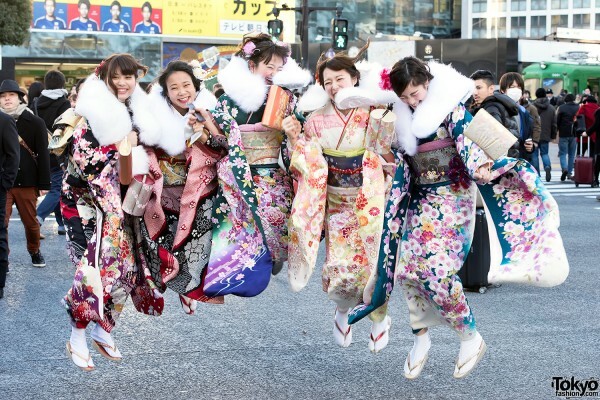 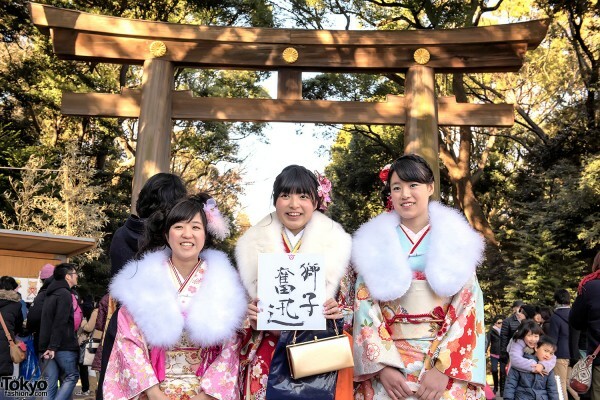 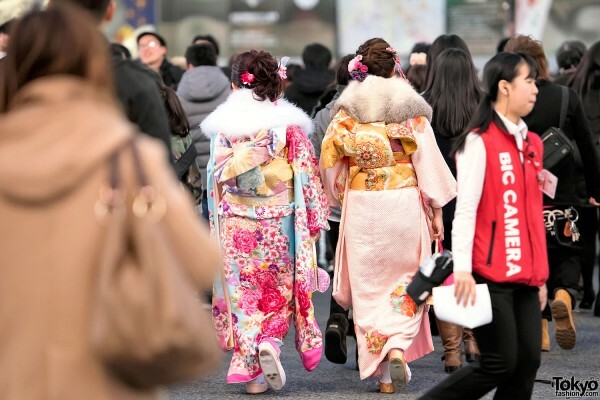 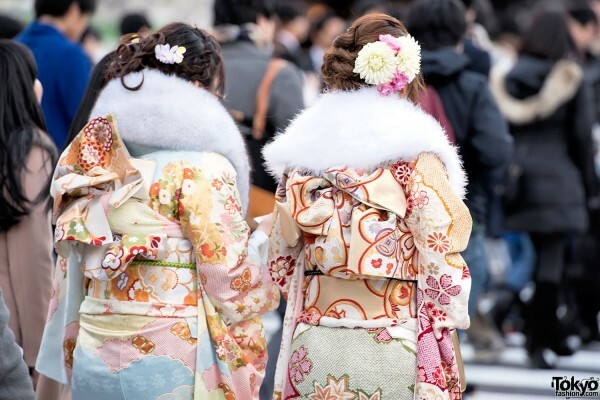 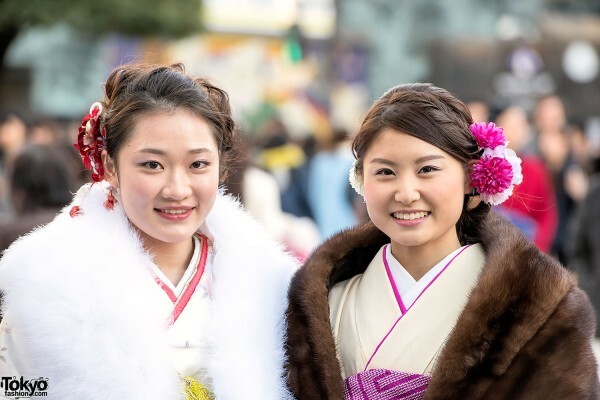 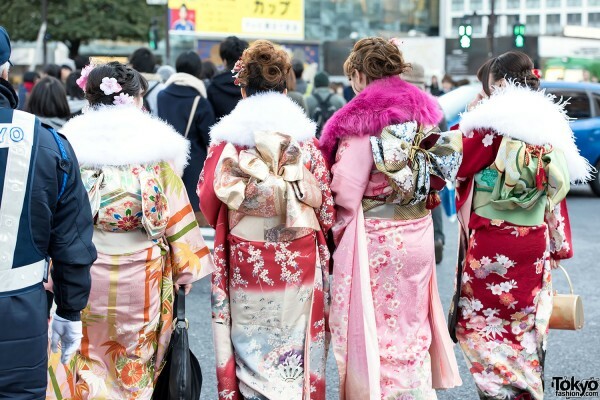 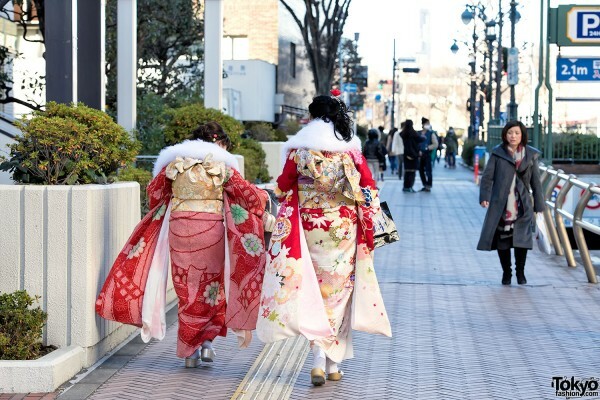 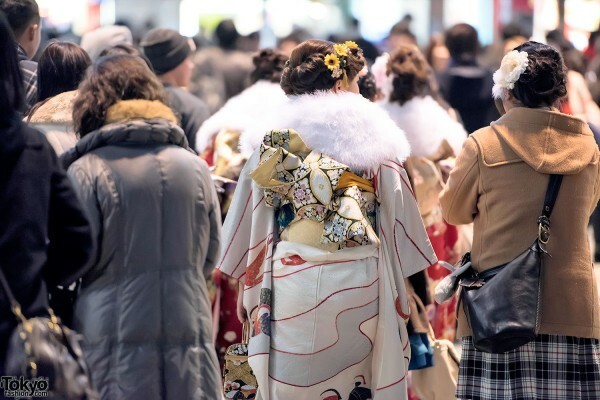 Seijin no Hi (known as “Coming of Age Day” in English) is a Japanese holiday held every year on the second month of January to celebrate the transition from childhood into adulthood. 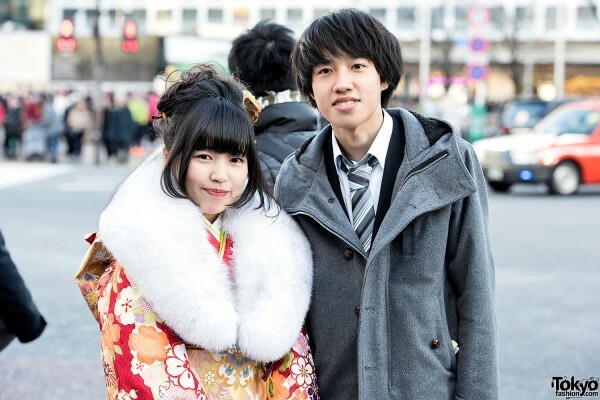 The official age of majority in Japan is 20 years old. 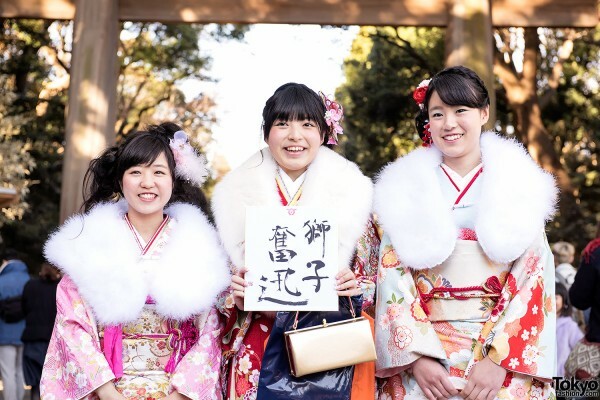 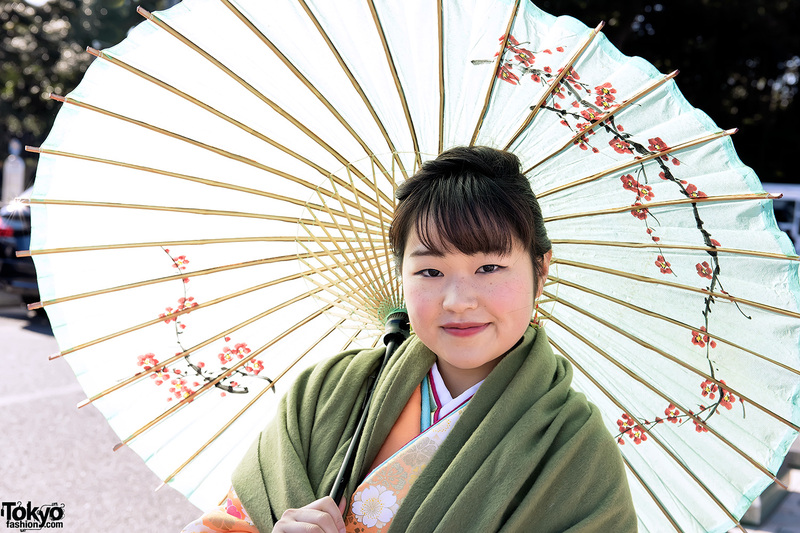 Thus, every Japanese citizen who reaches the age of 20 between April 2nd of the previous year and April 1st of the current year is invited to participate in a ceremony in their honor on Coming of Age Day. 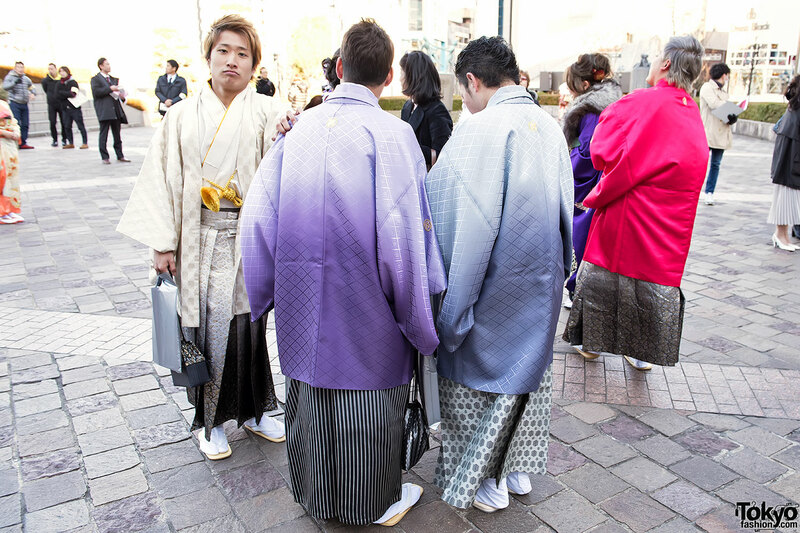 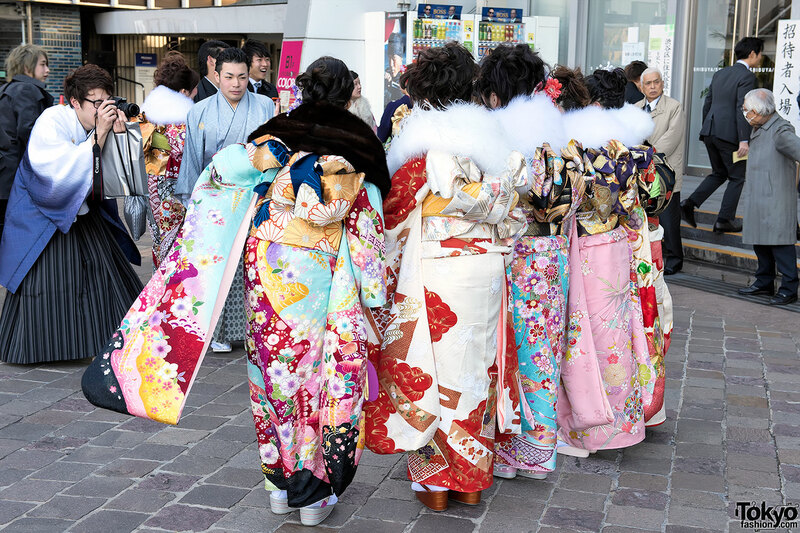 The ceremonies are held by local governments in thousands of locations all across Japan. 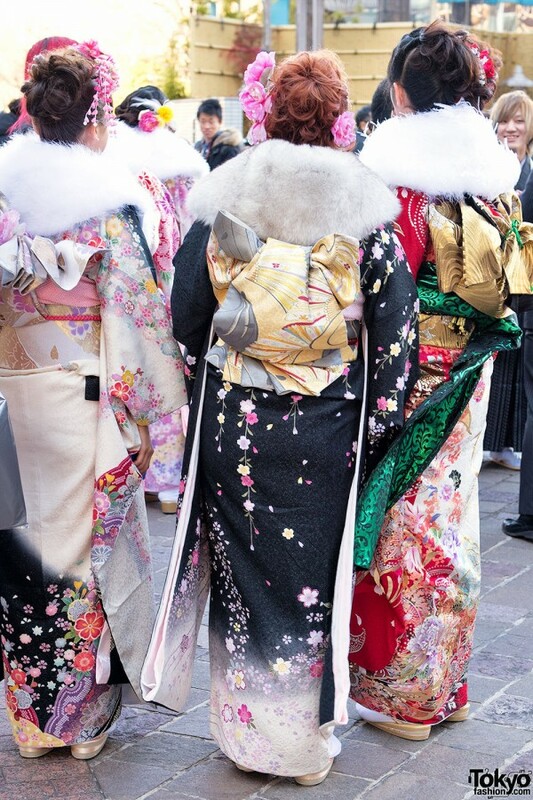 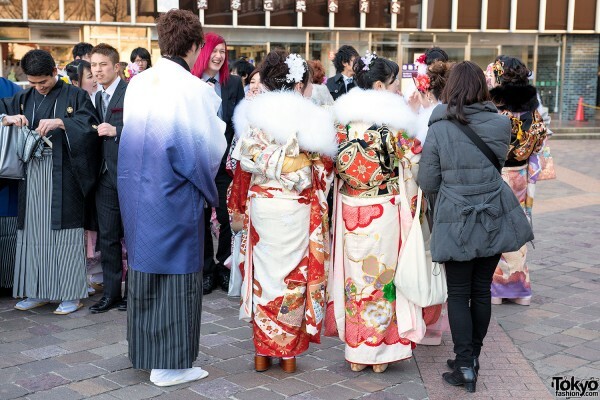 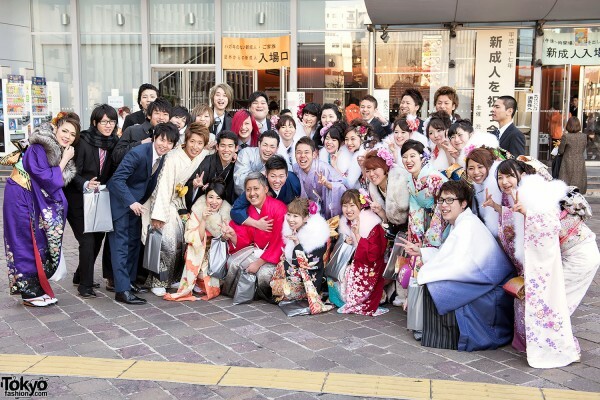 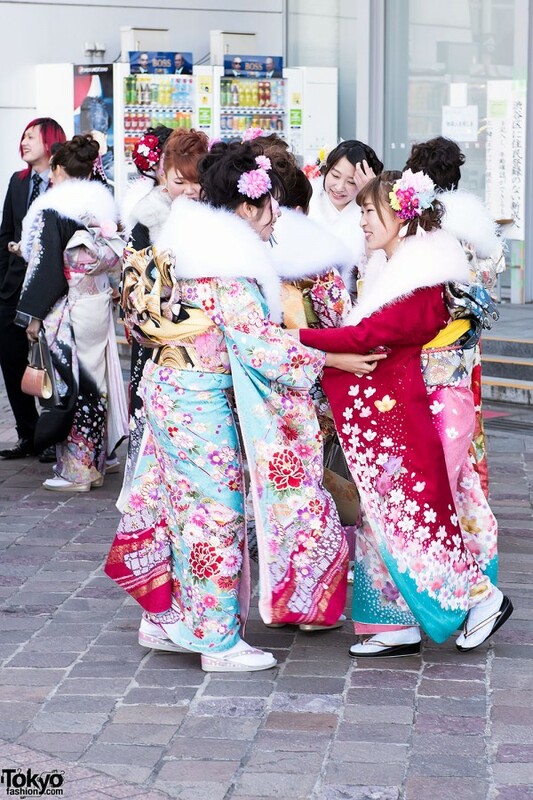 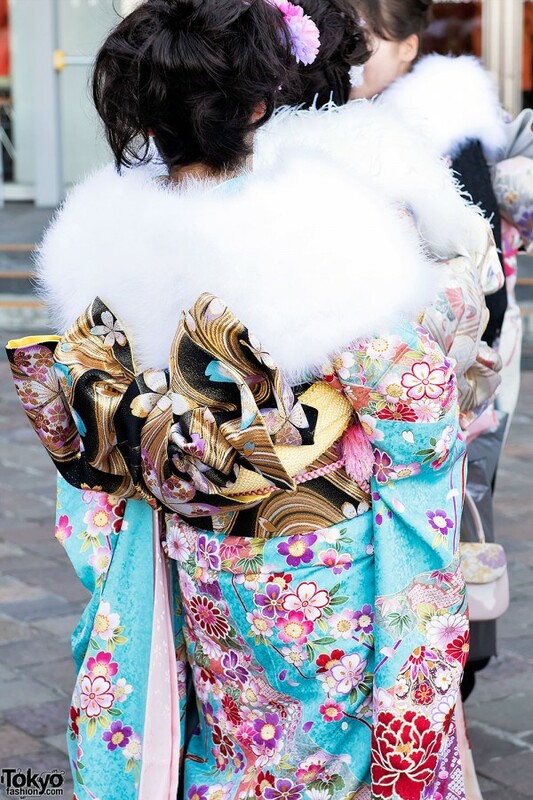 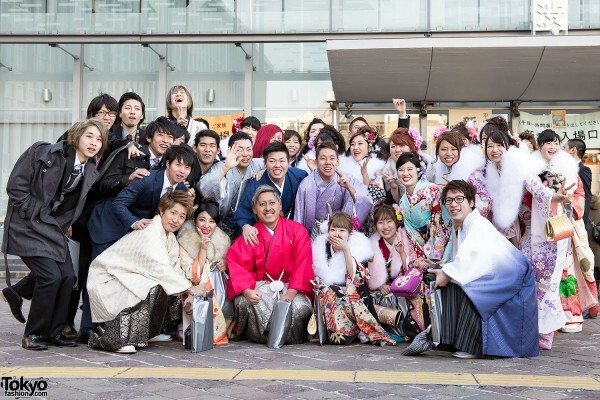 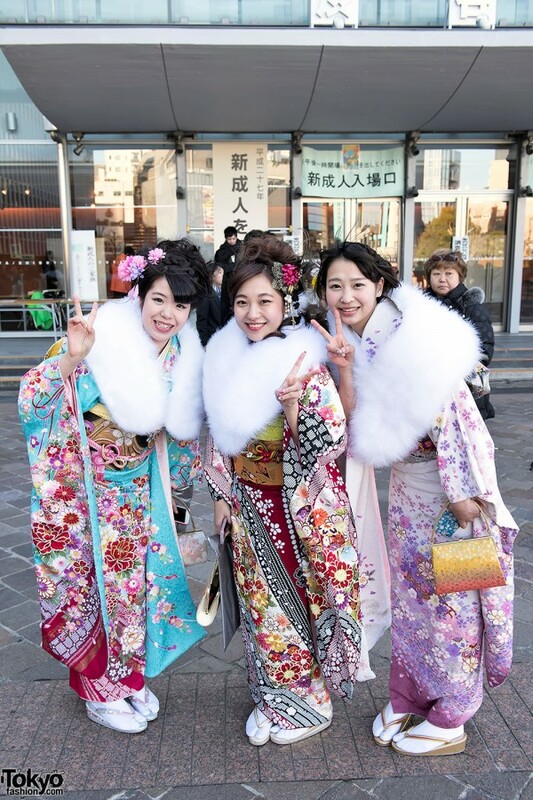 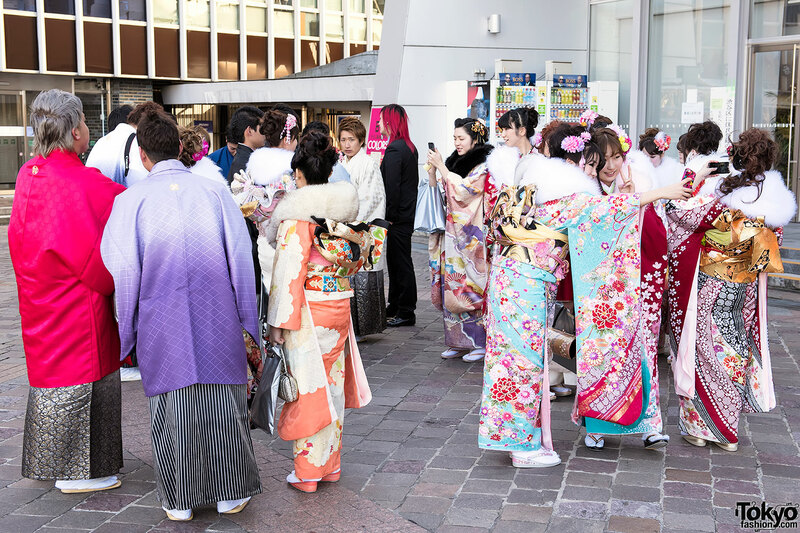 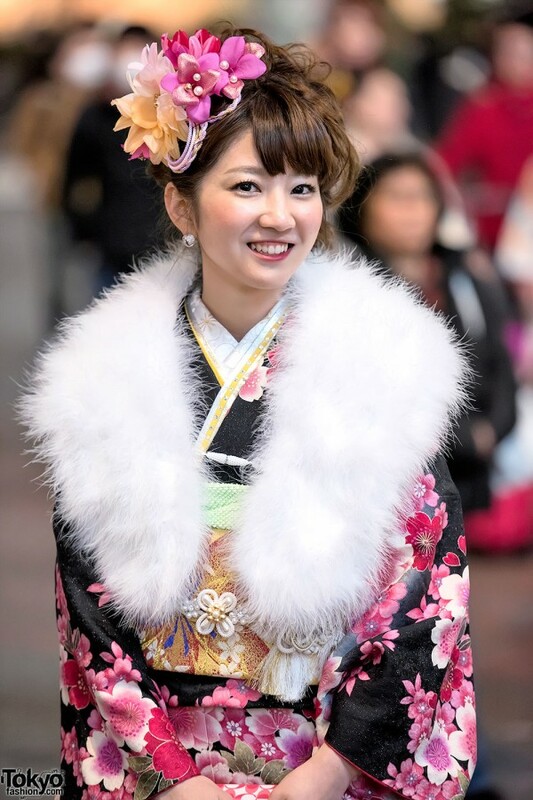 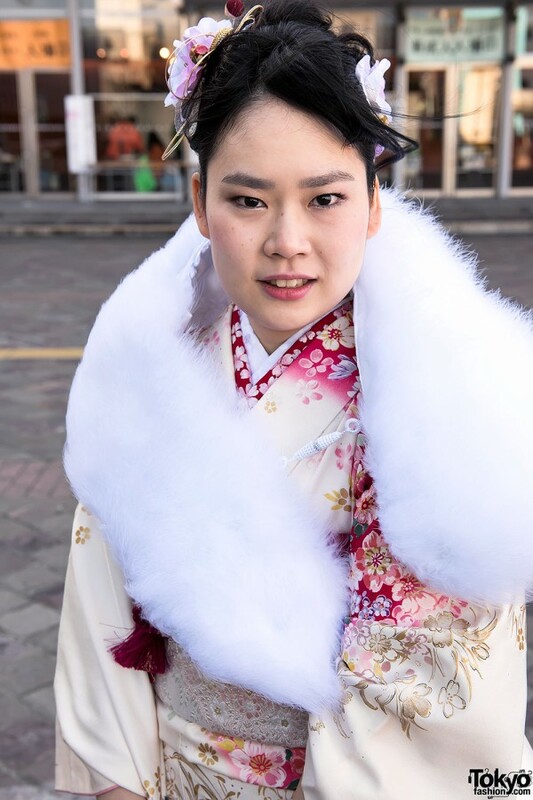 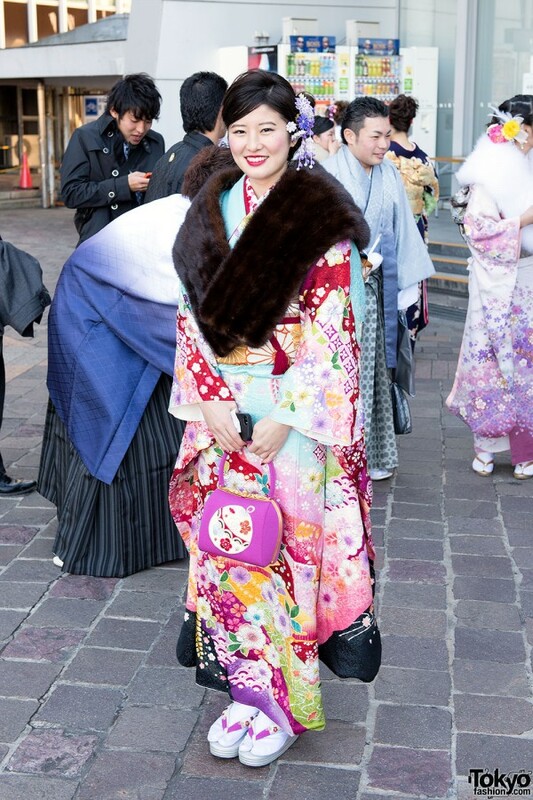 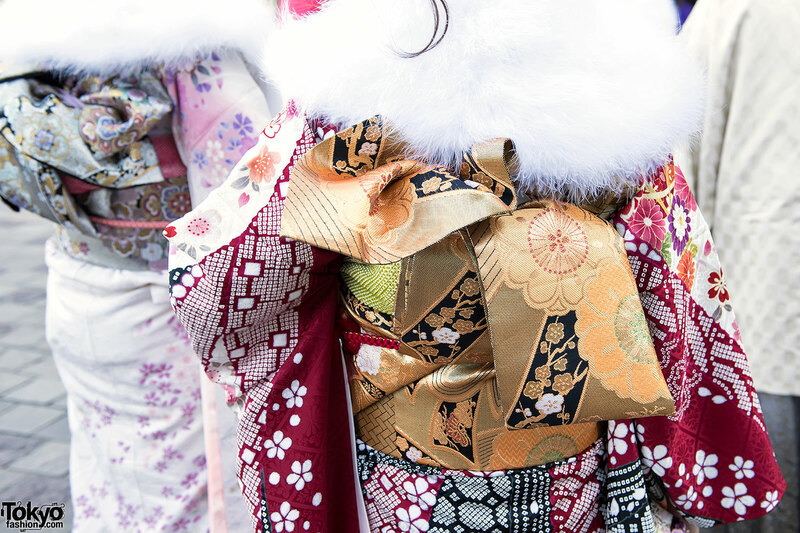 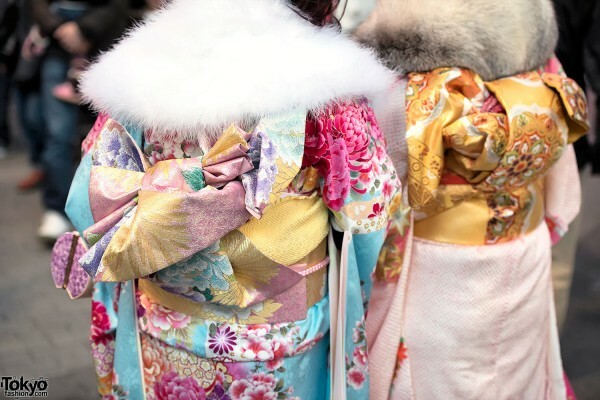 The traditional costume worn by young adults who participate in these ceremonies is a colorful furisode kimono for women or a hakama for men. 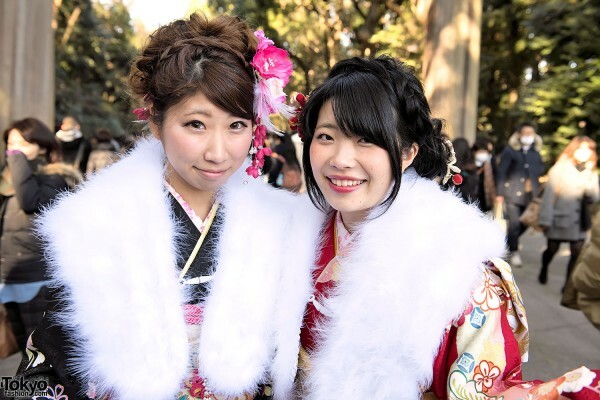 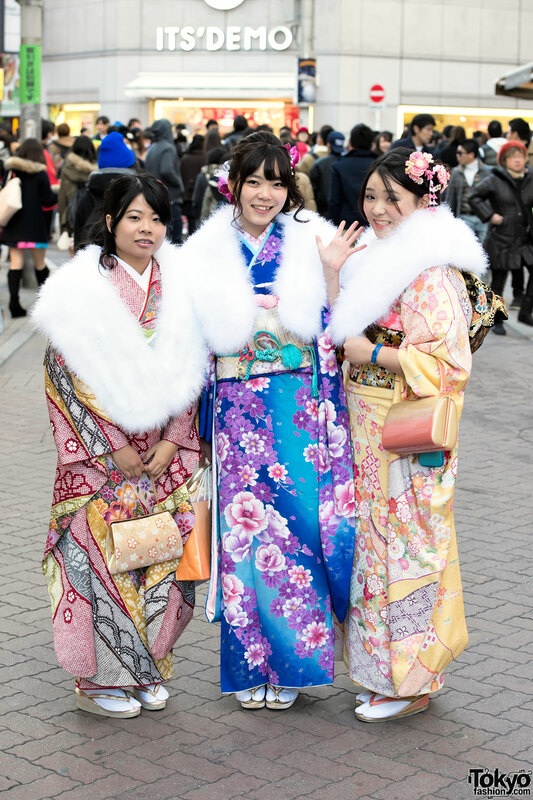 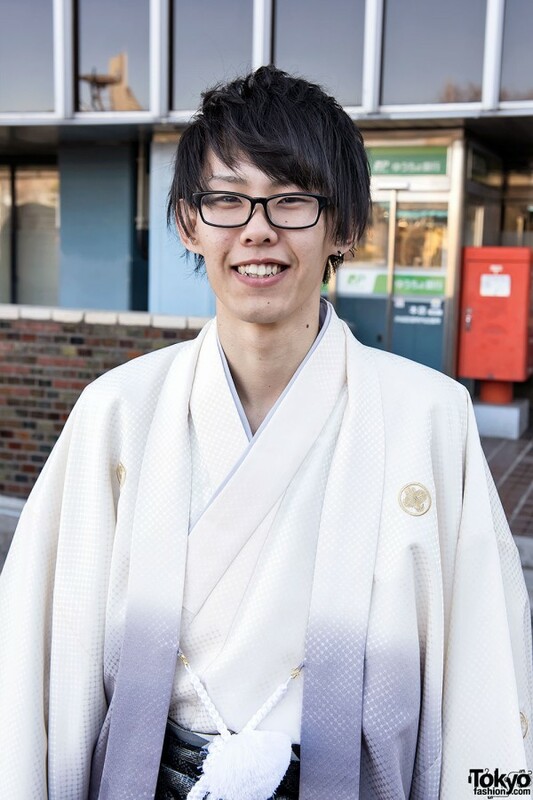 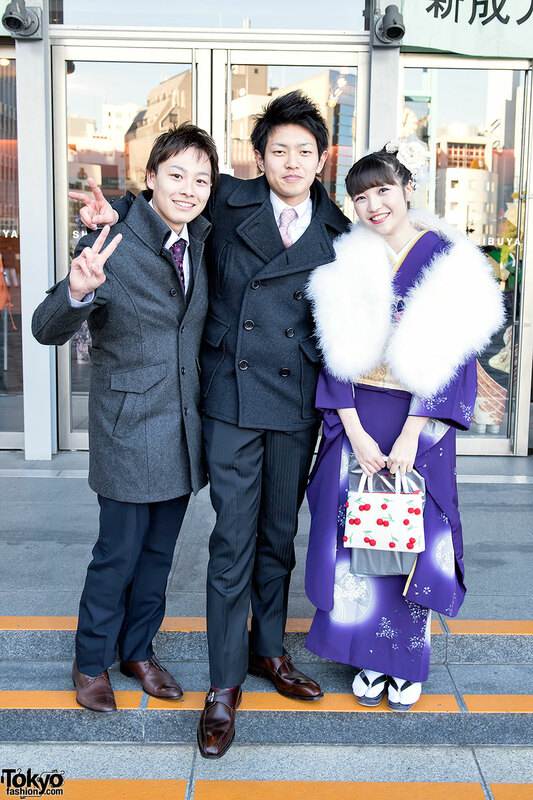 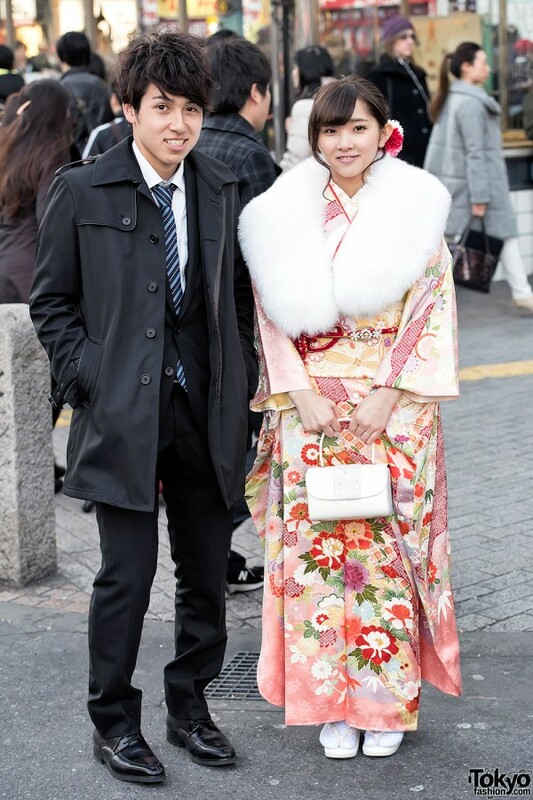 These days, many young men choose suits instead of hakama, but a large percentage of young women still favor the traditional kimono. 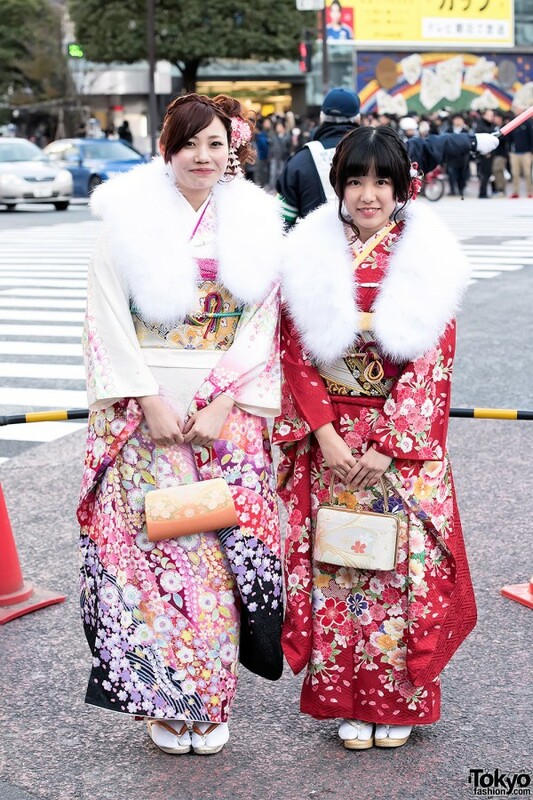 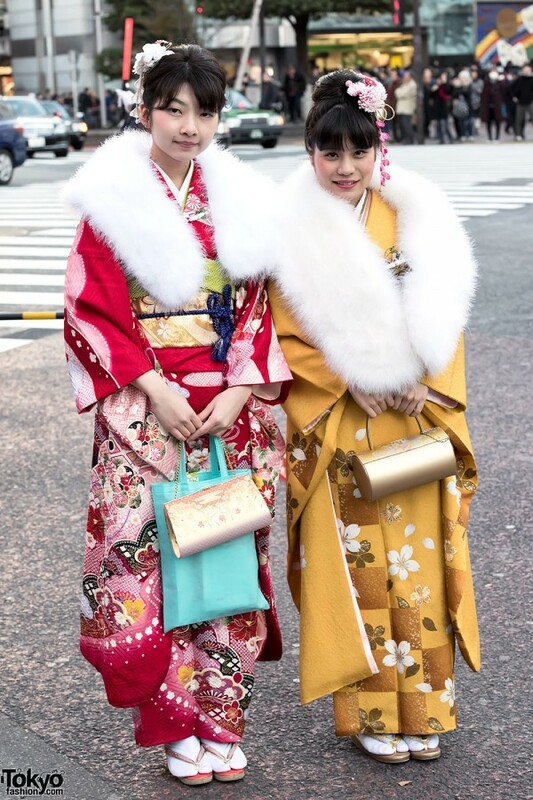 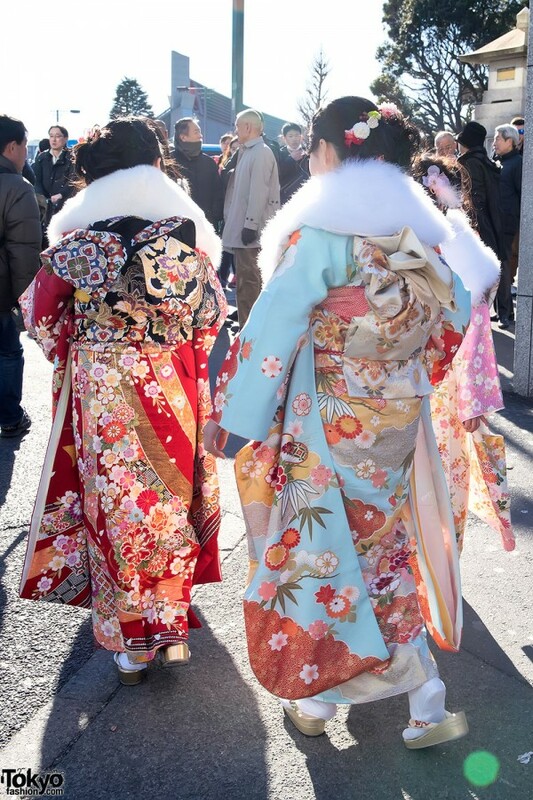 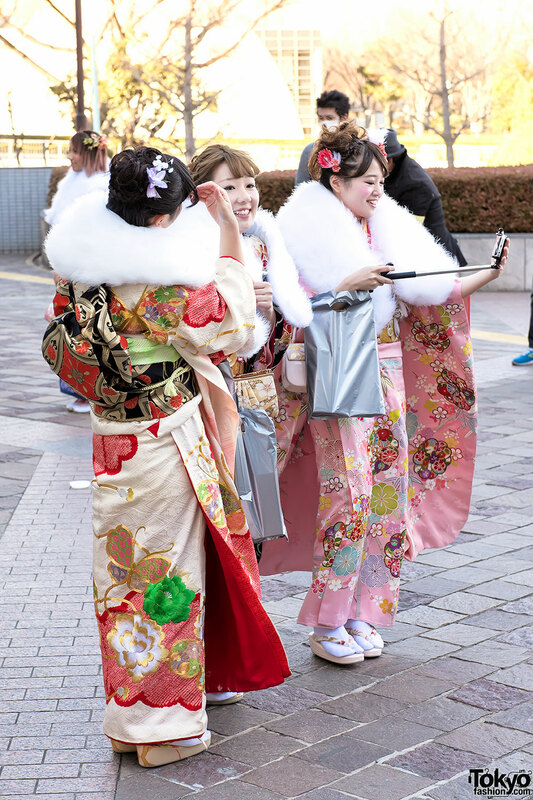 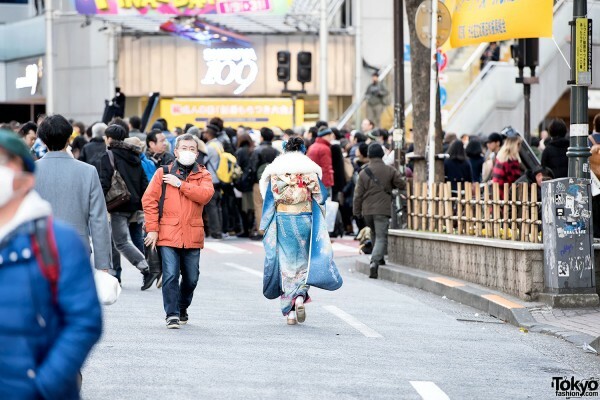 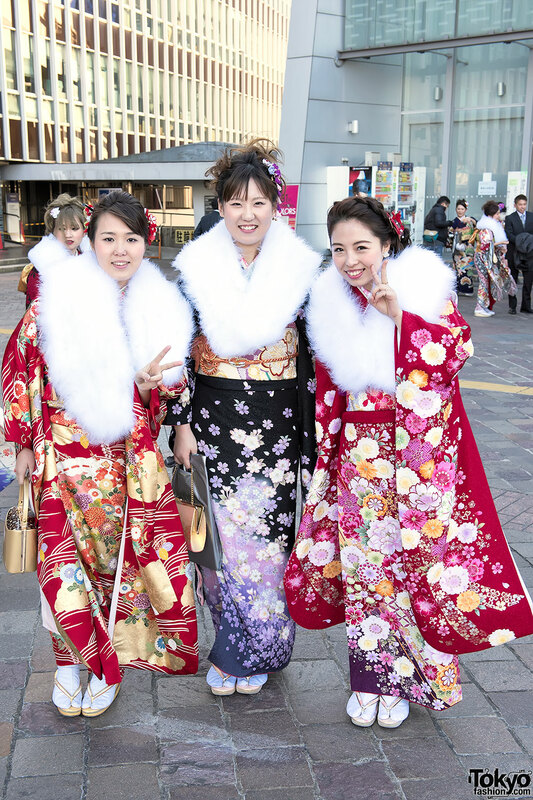 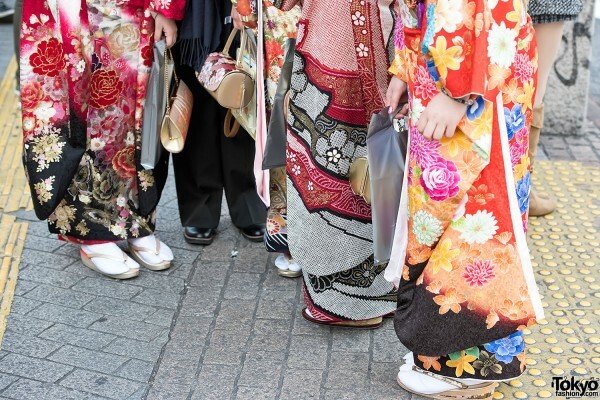 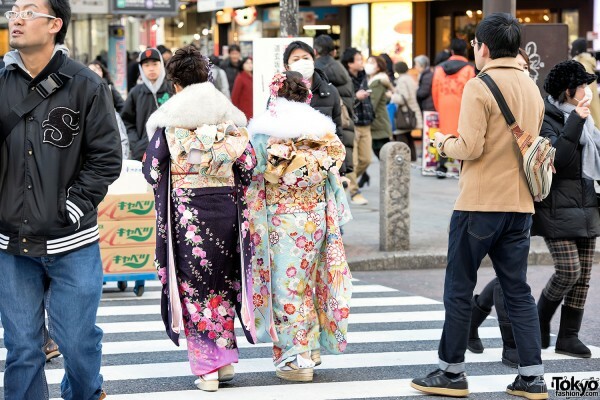 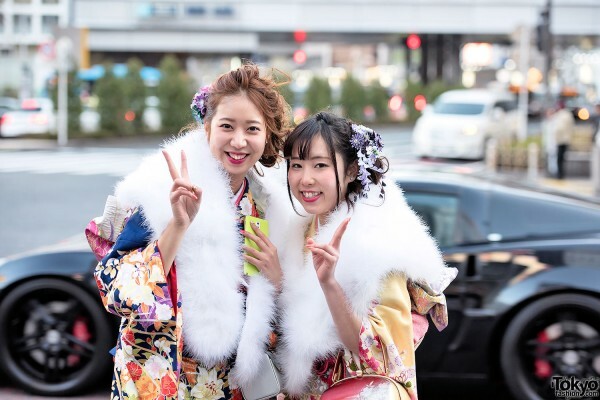 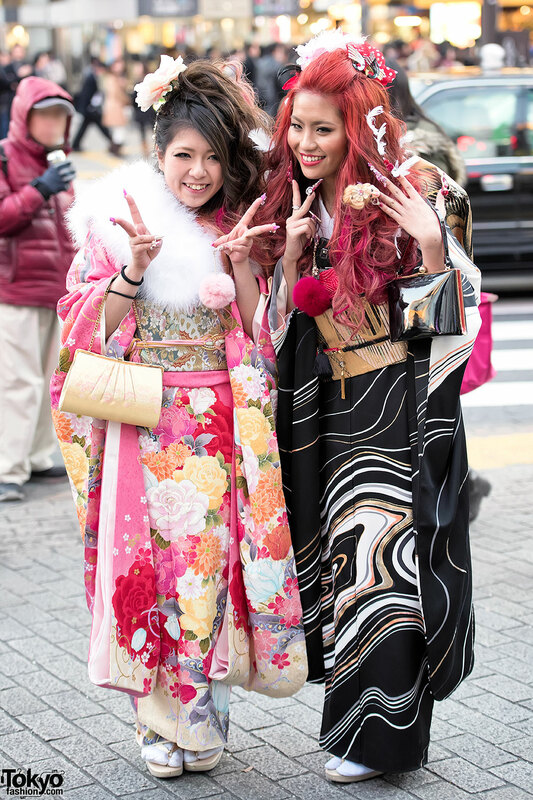 This makes the day very special for everyone in Japan because they can see young people walking around the streets in colorful traditional clothing. Both Harajuku and Shibuya are located in the Shibuya Ward of Tokyo, so the ceremony for young people from these areas is held at the Shibuya Ward Office. 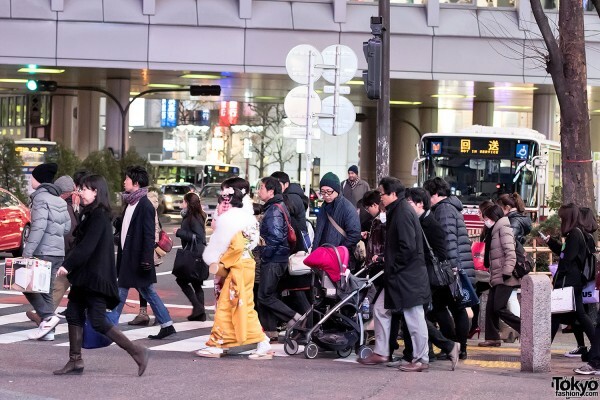 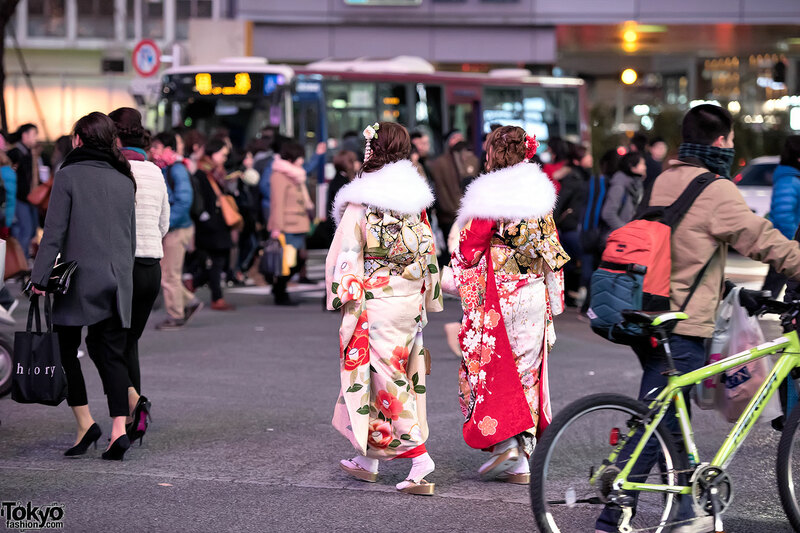 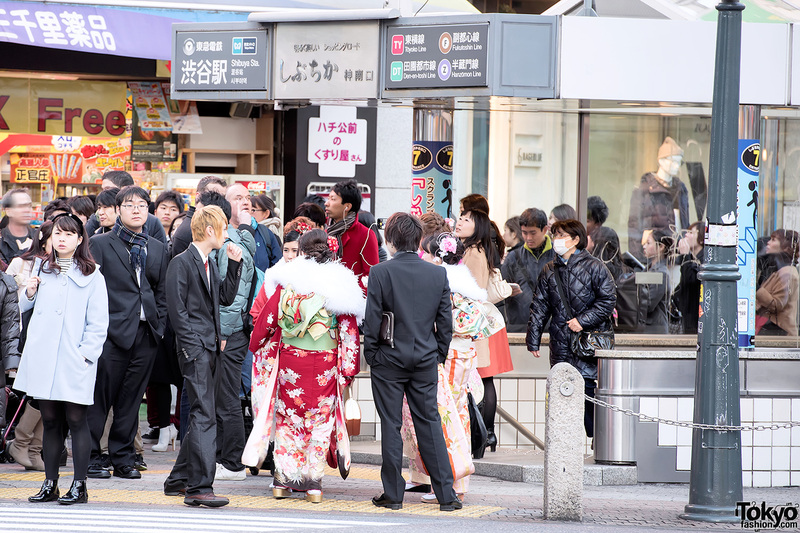 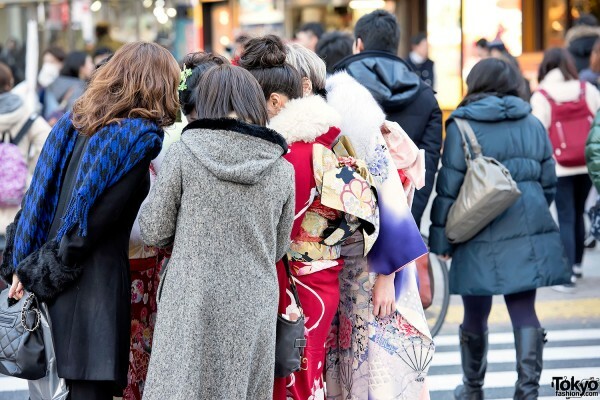 After the afternoon ceremony ends, young adults in kimono and hakama flood into the streets of Shibuya to meet up with their friends. These groups of young adults often party the night away celebrating their transition into adulthood. 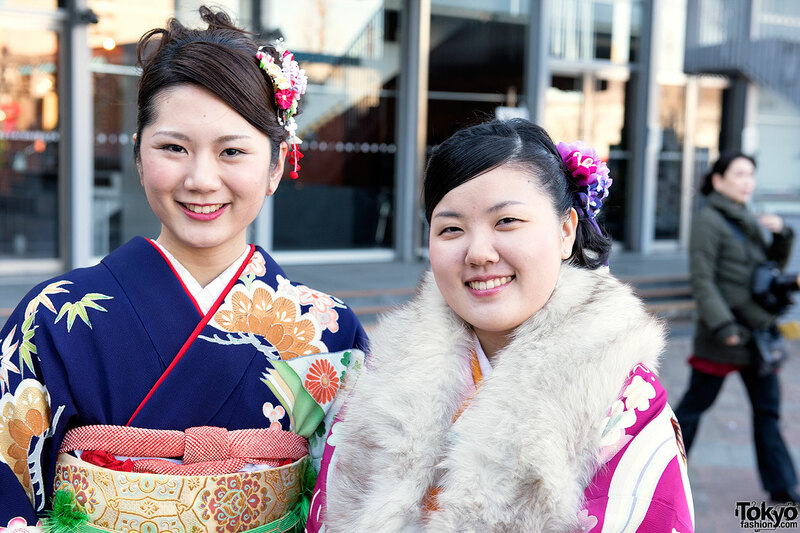 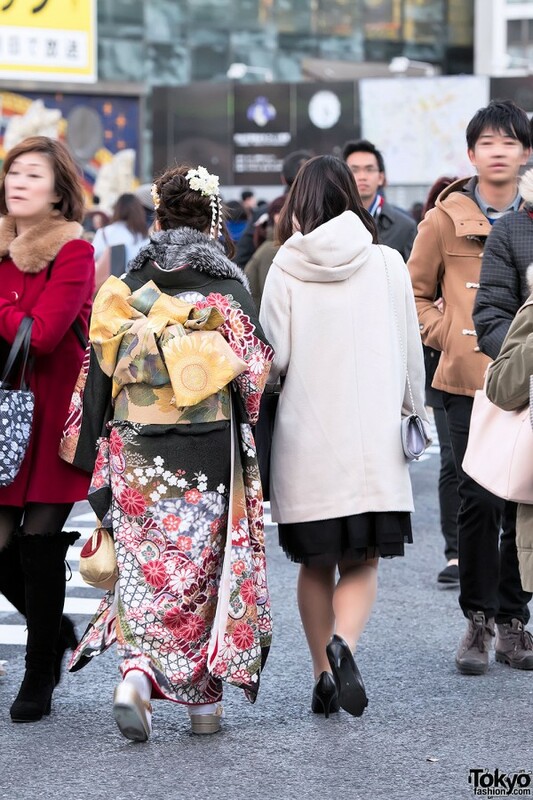 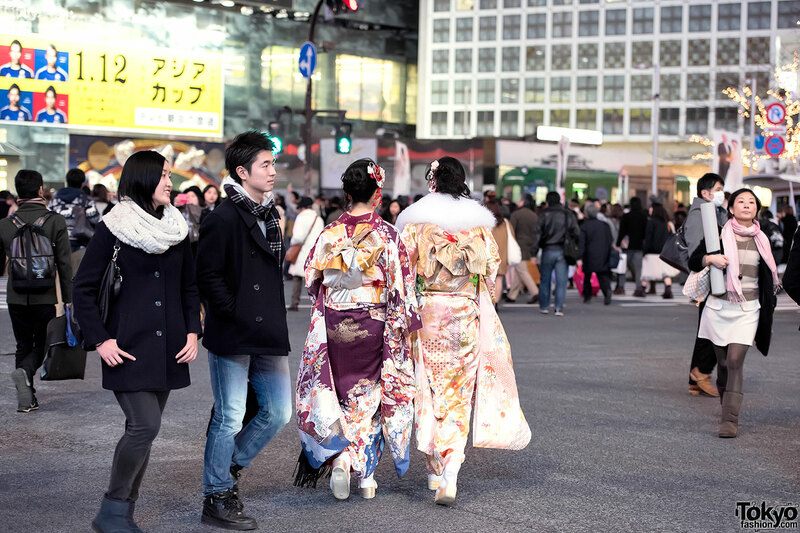 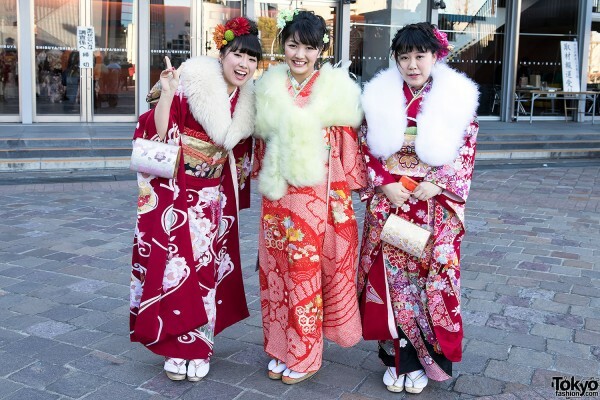 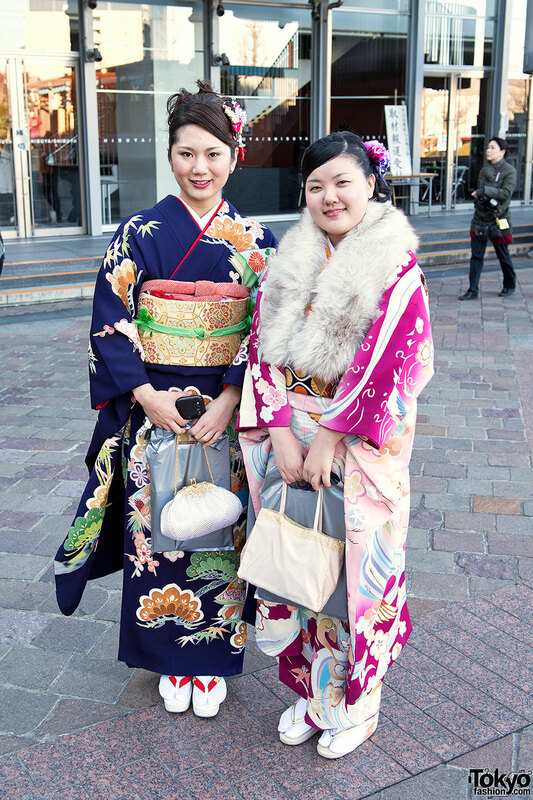 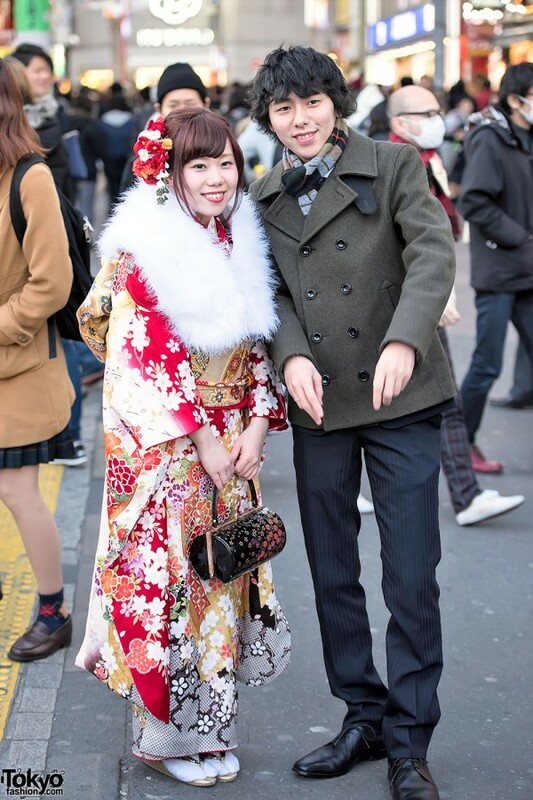 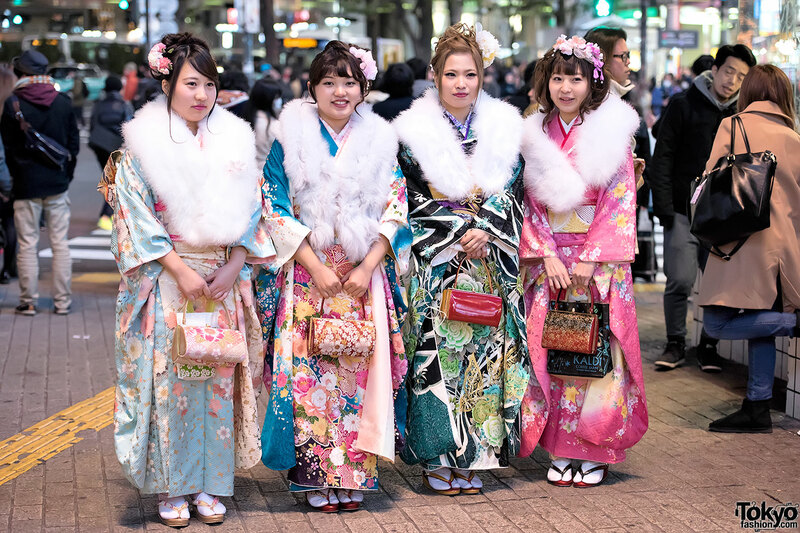 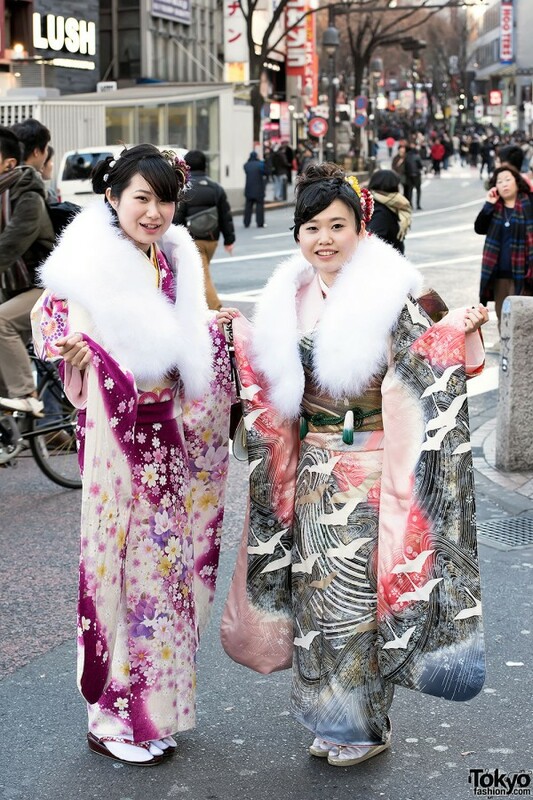 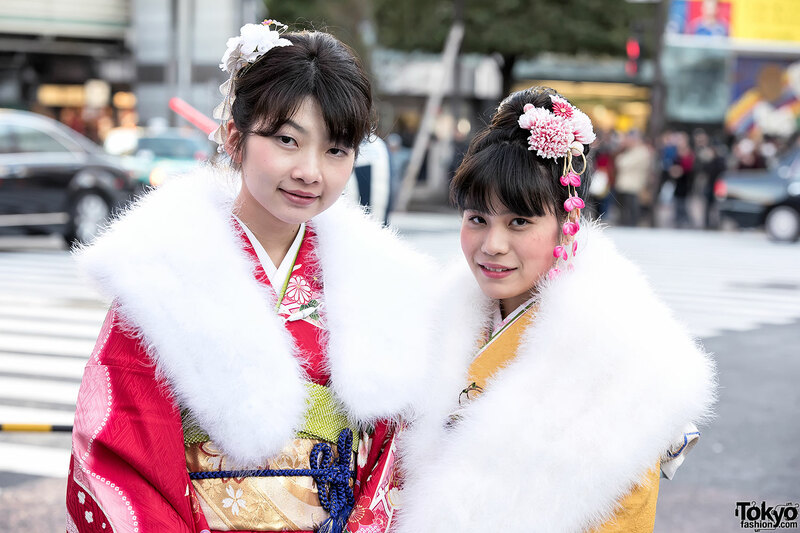 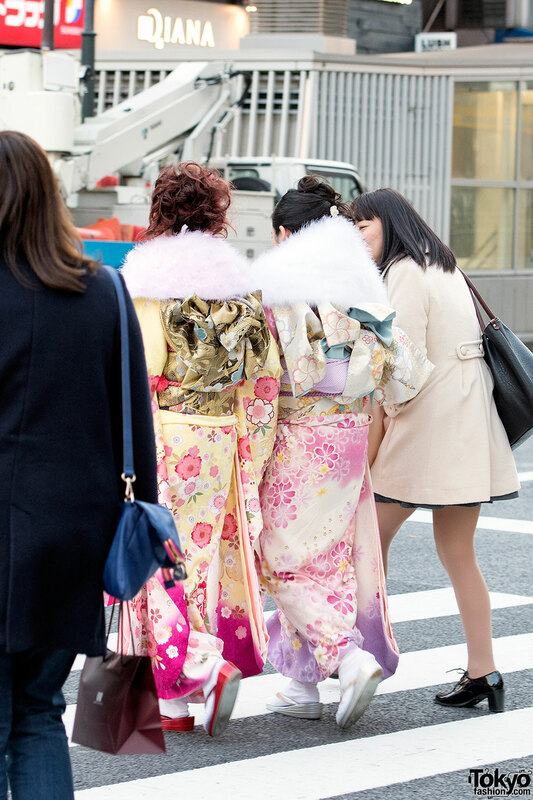 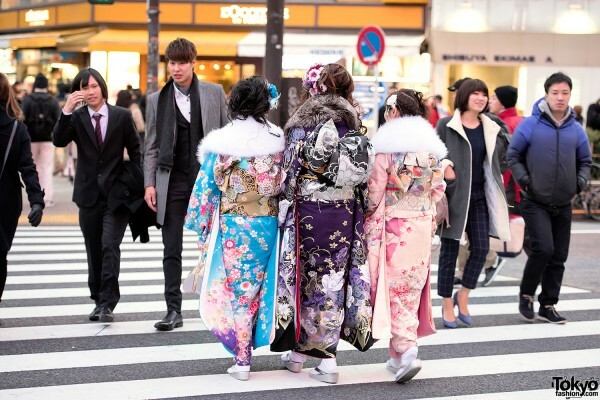 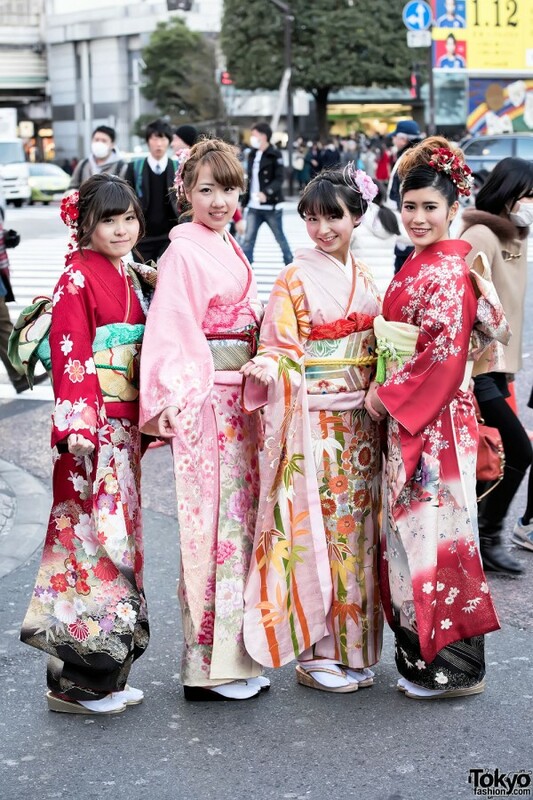 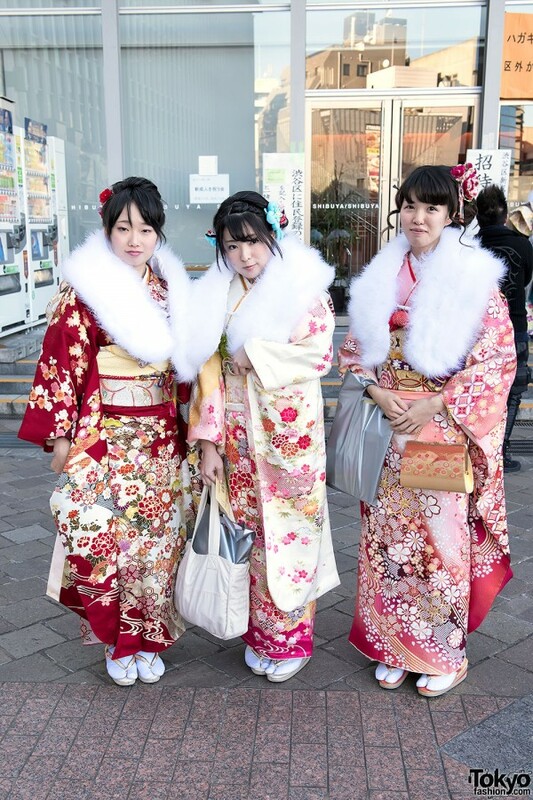 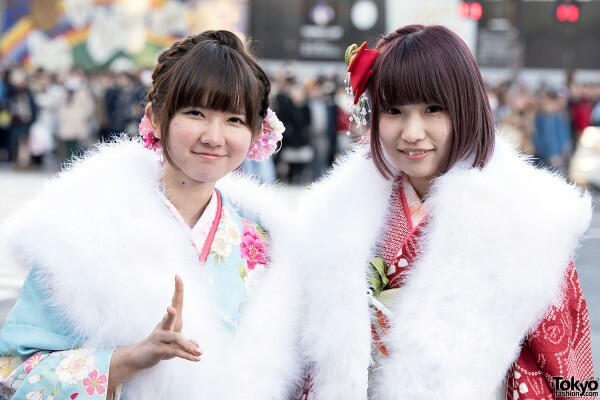 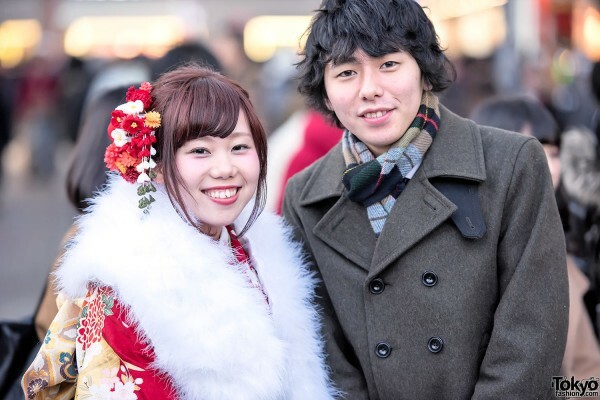 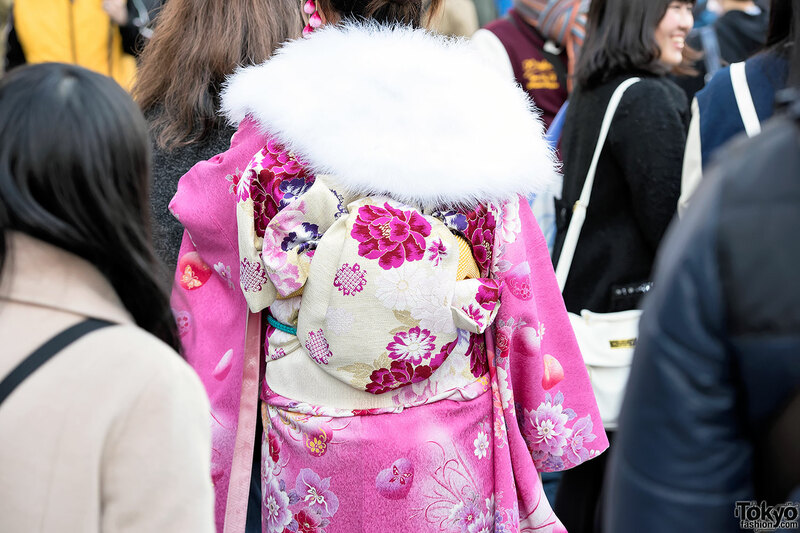 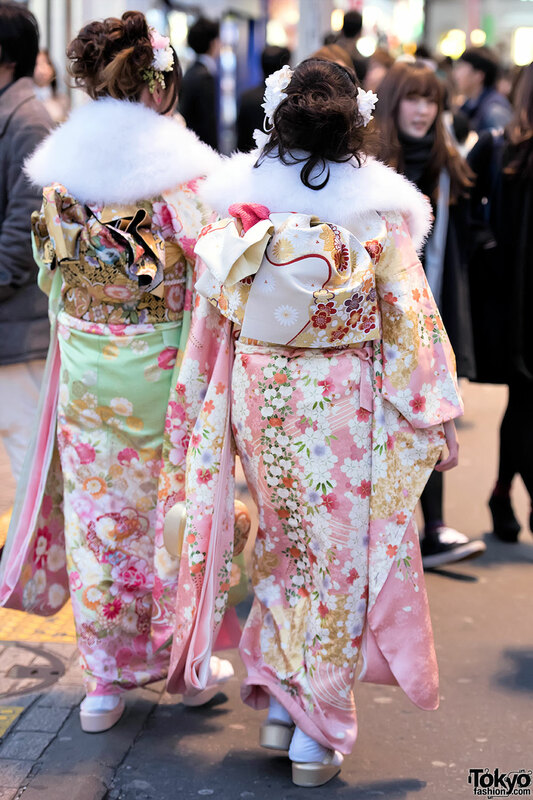 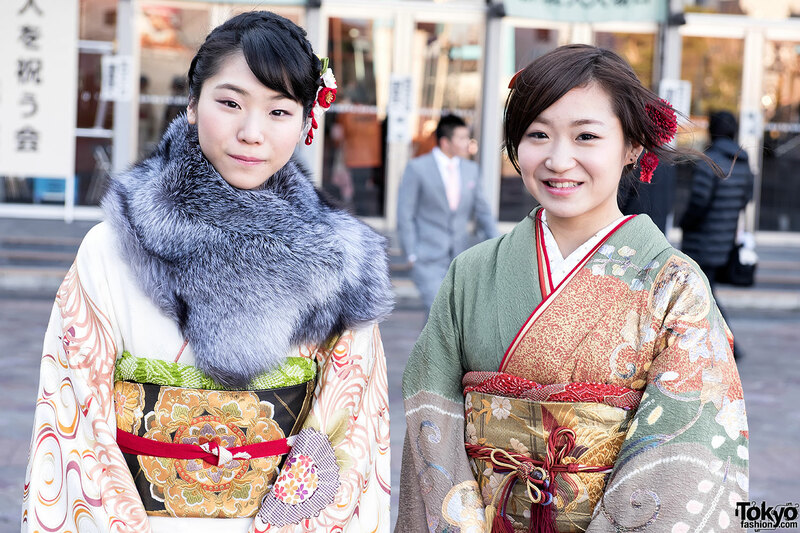 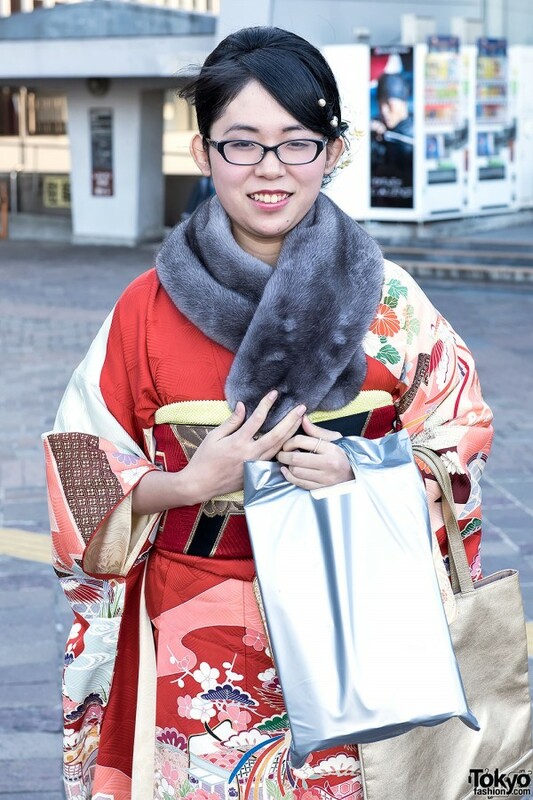 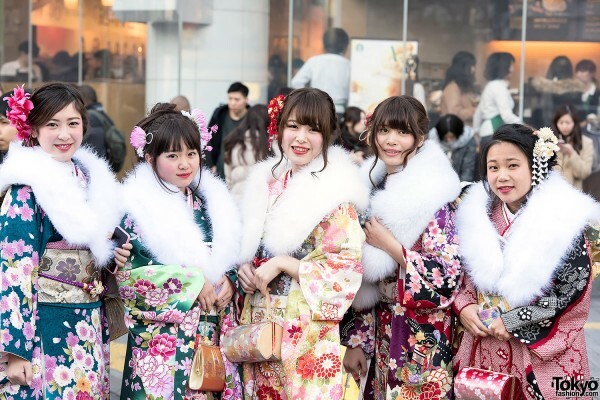 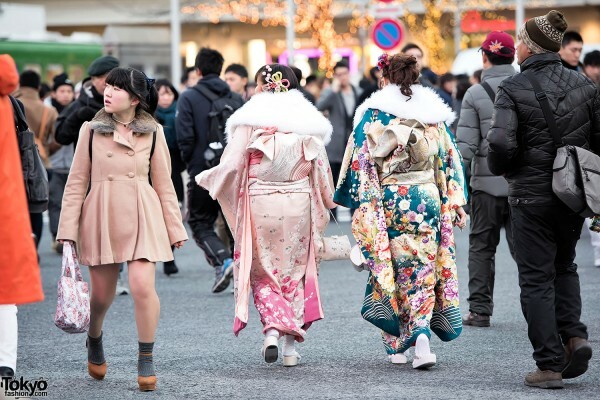 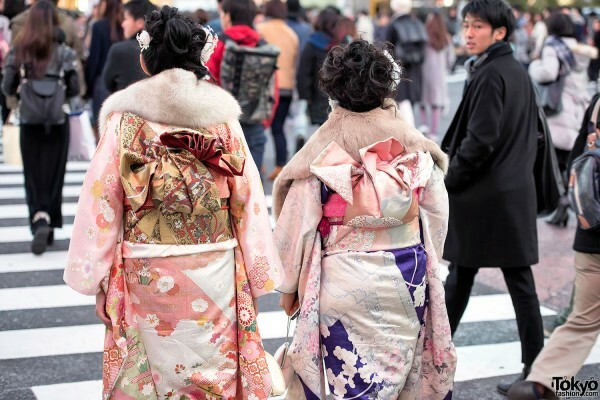 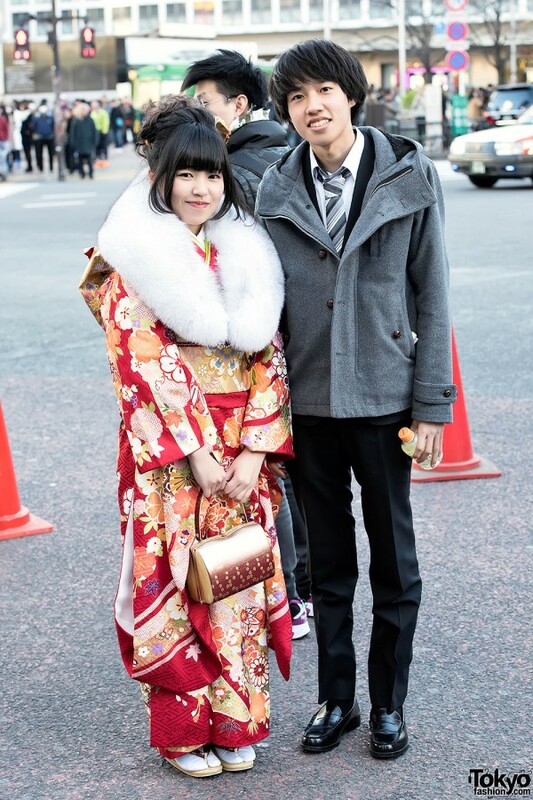 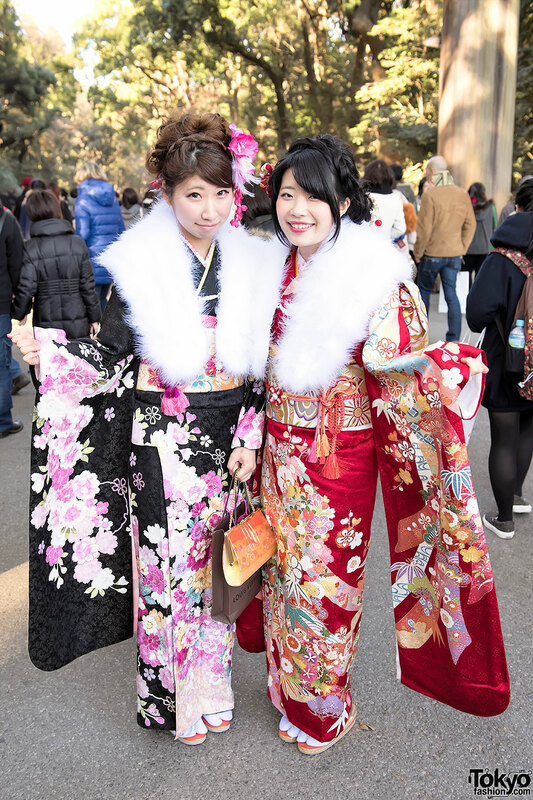 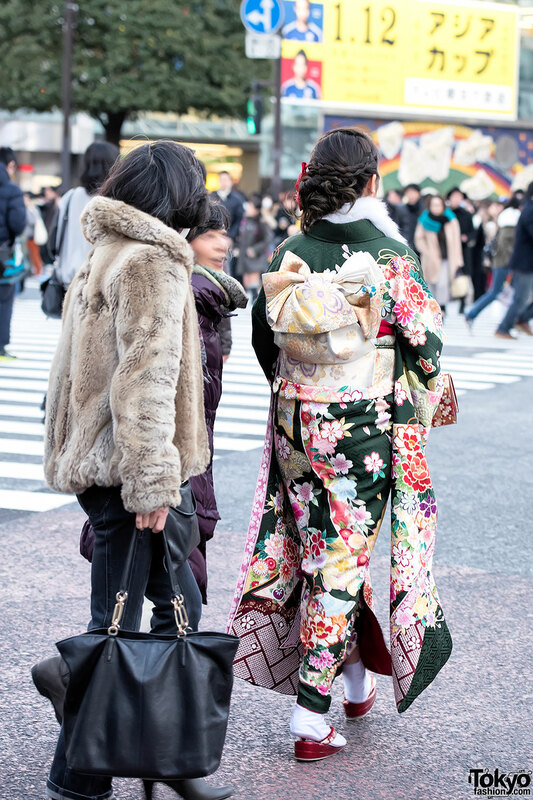 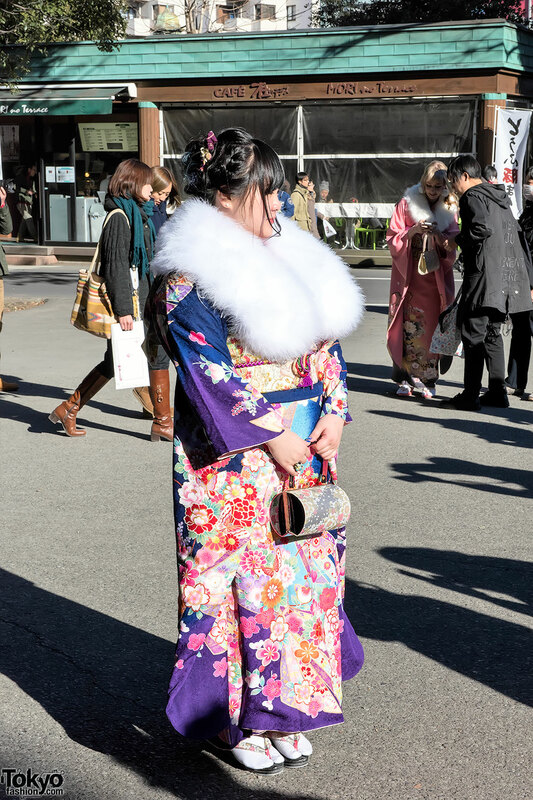 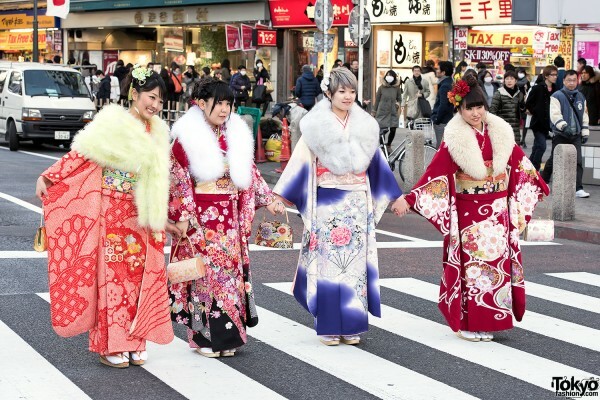 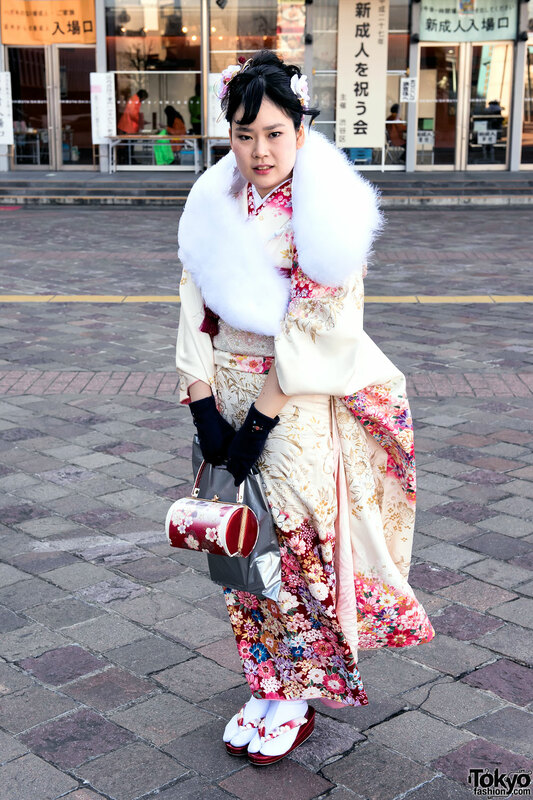 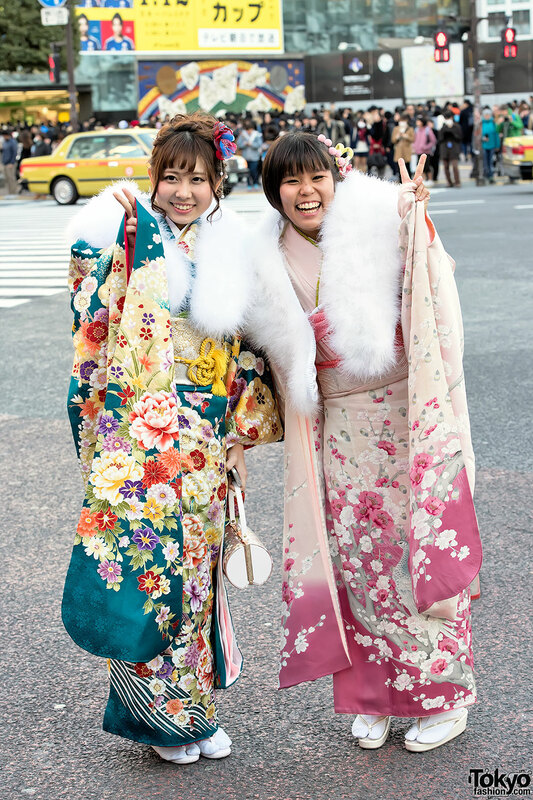 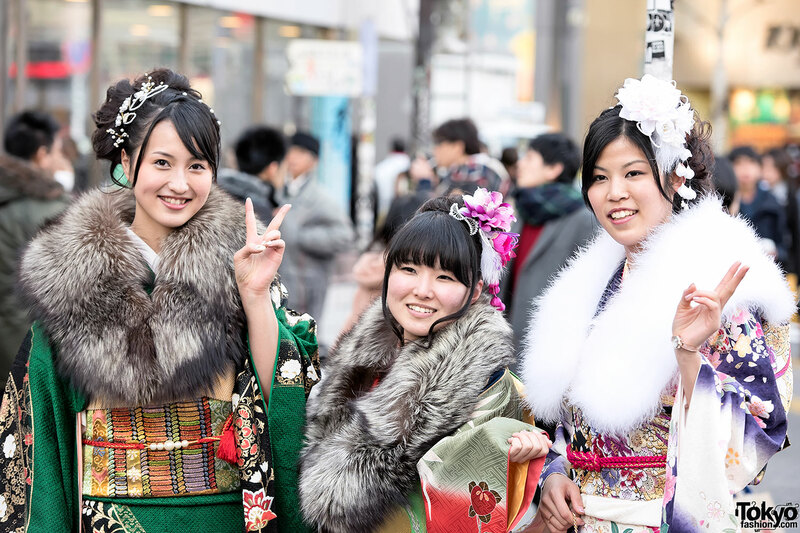 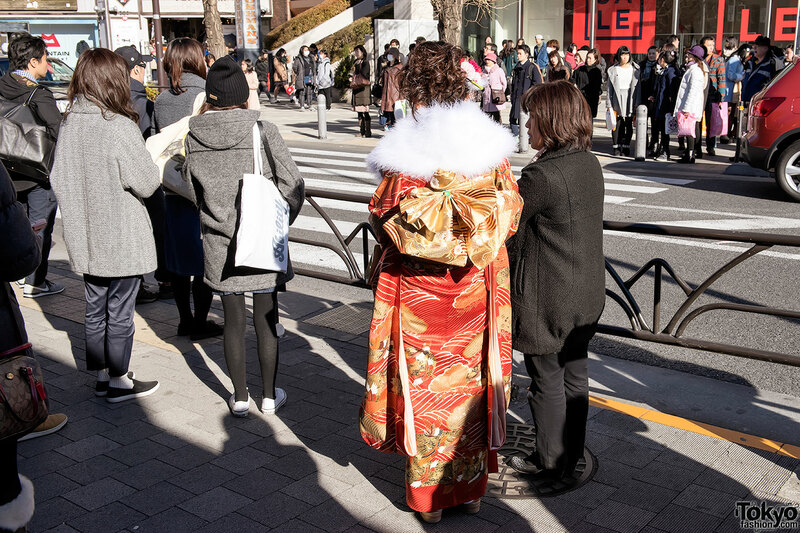 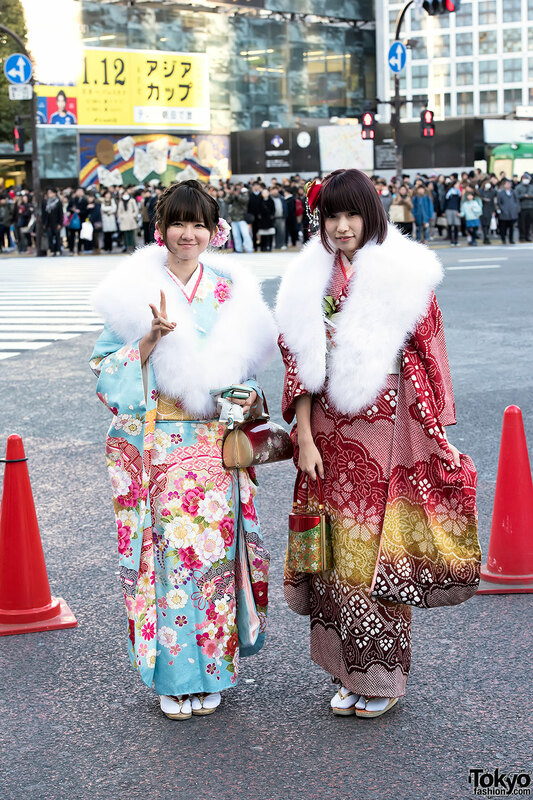 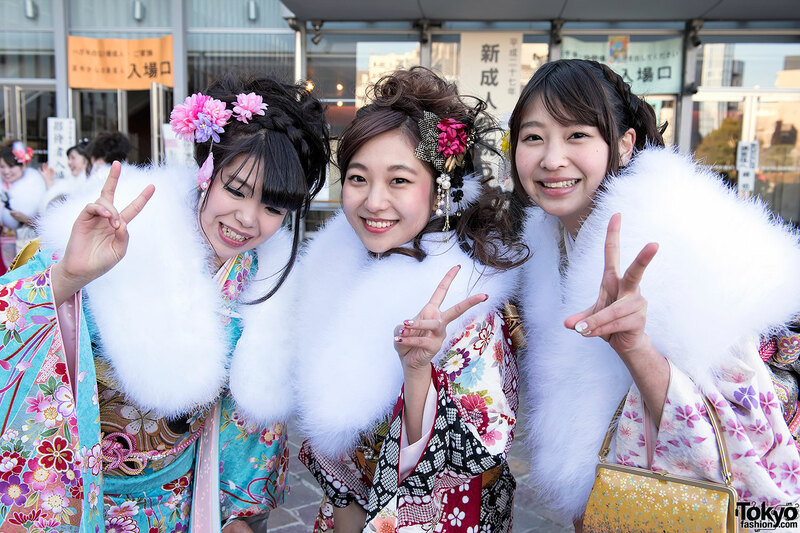 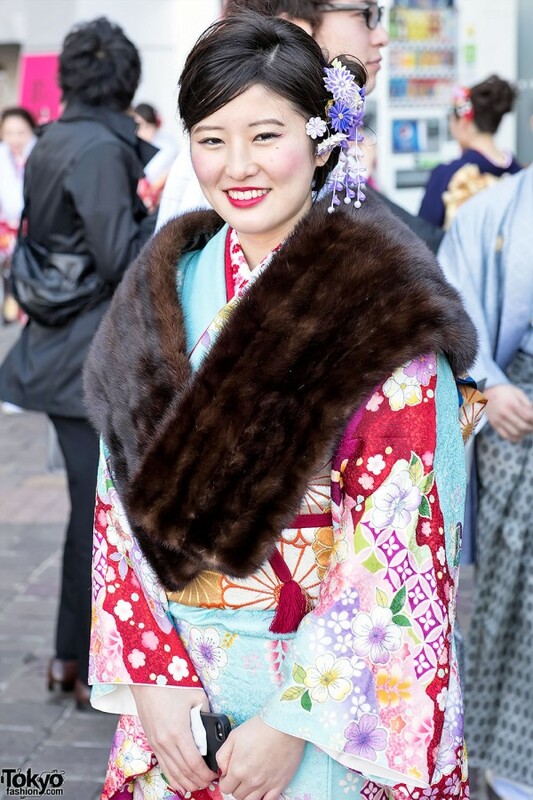 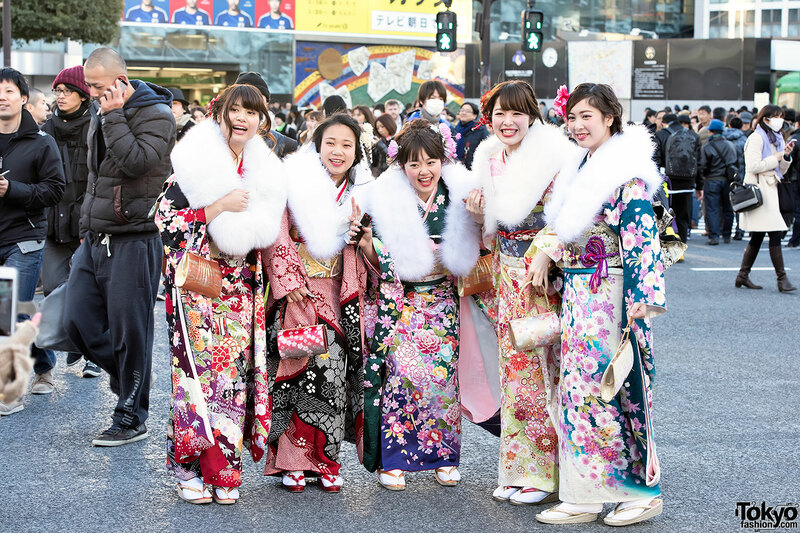 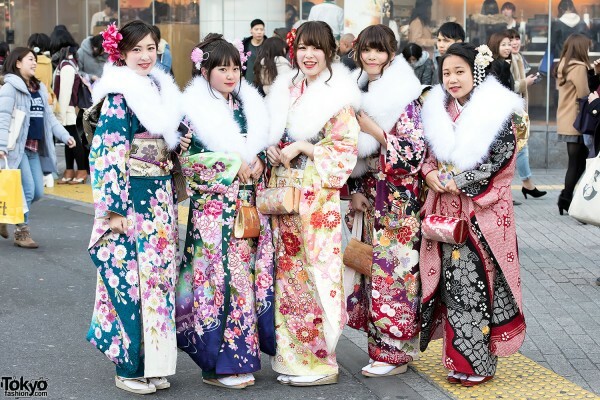 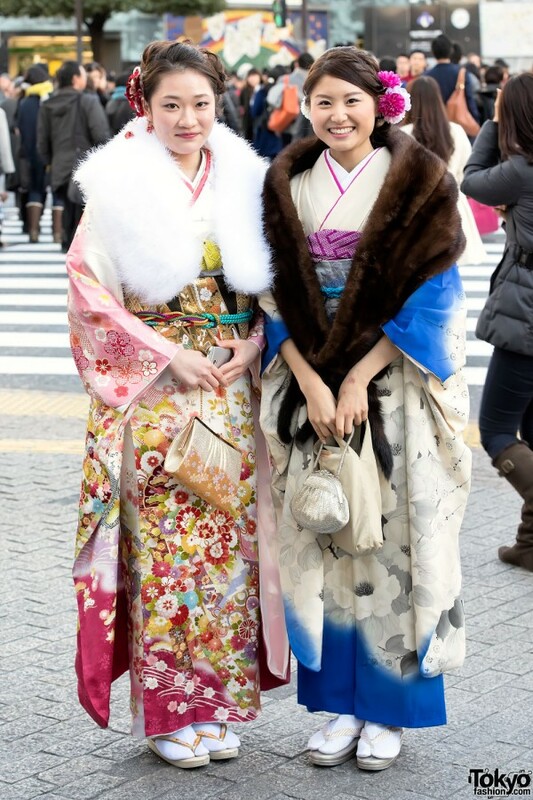 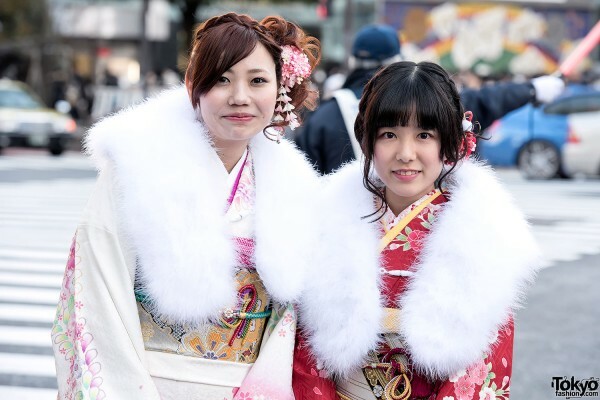 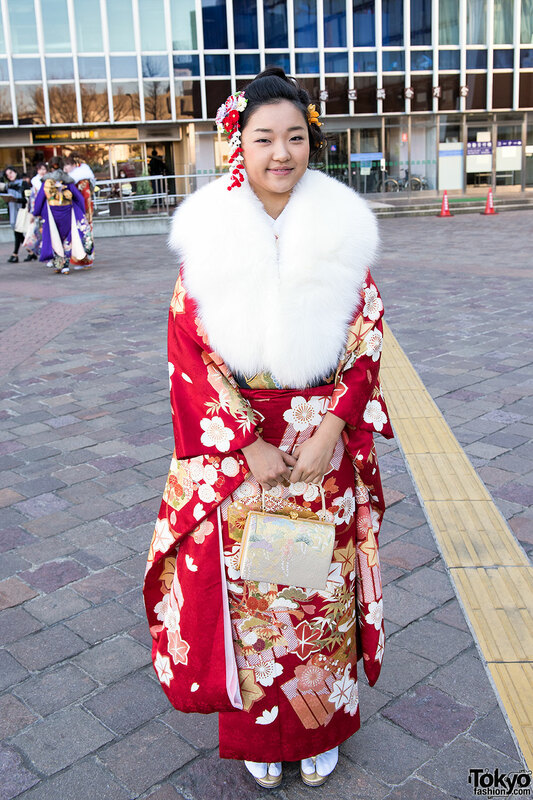 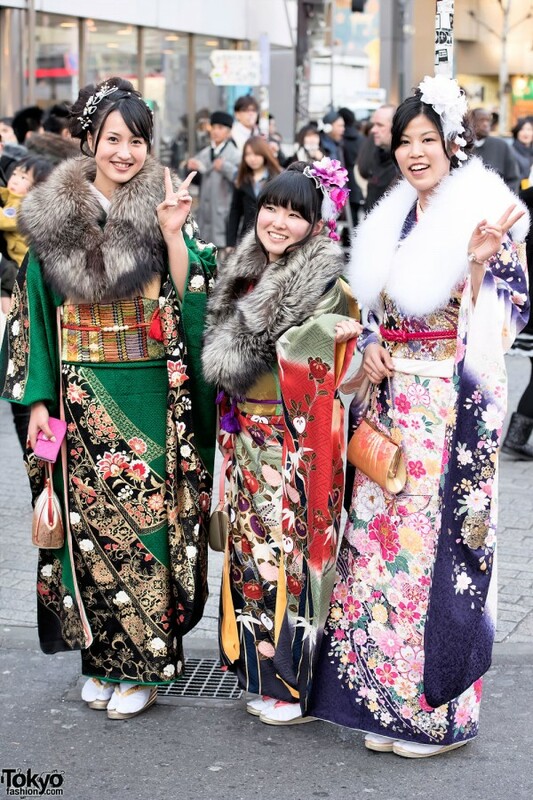 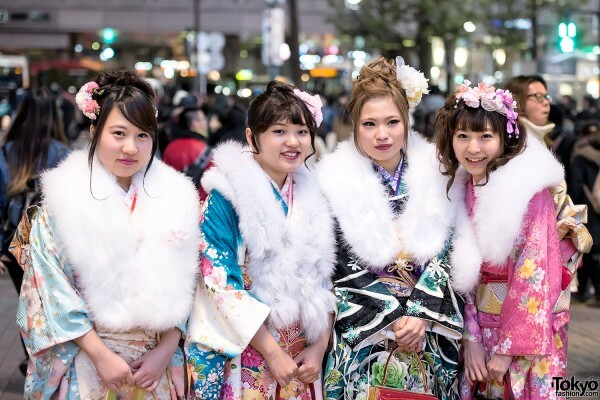 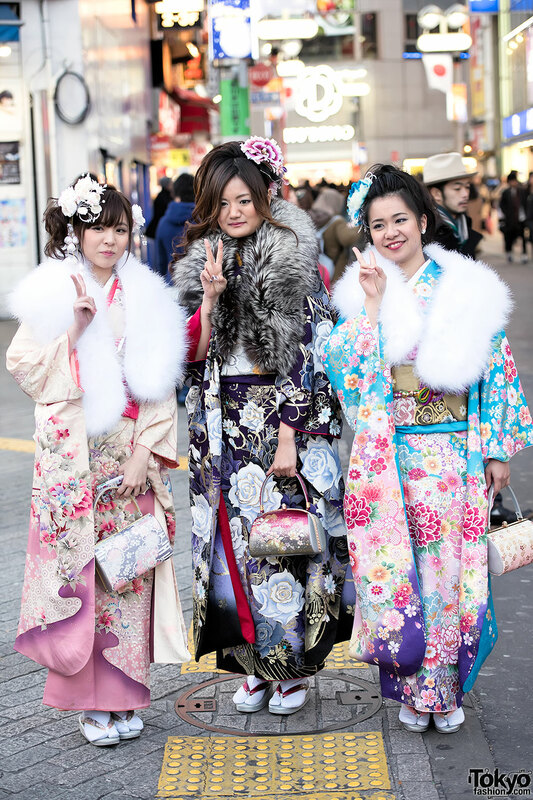 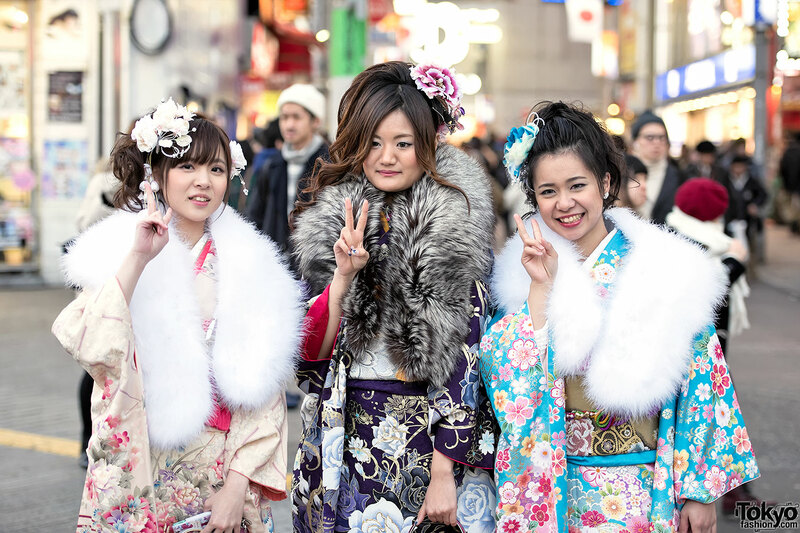 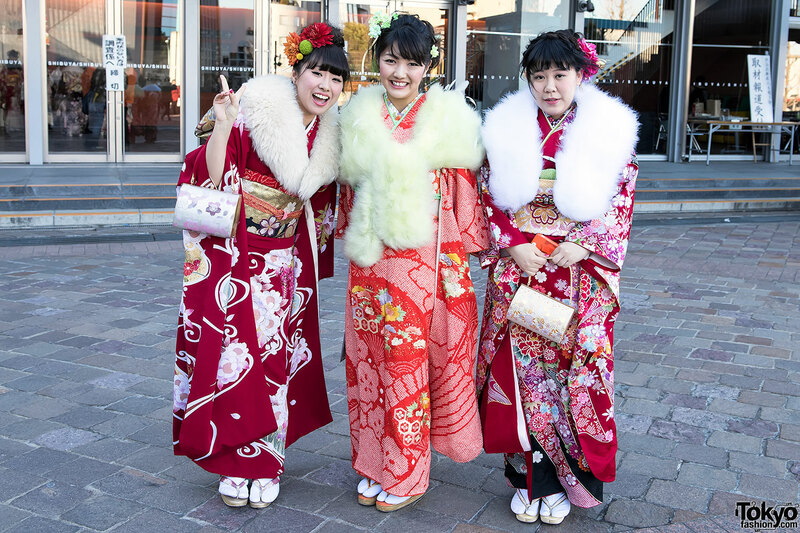 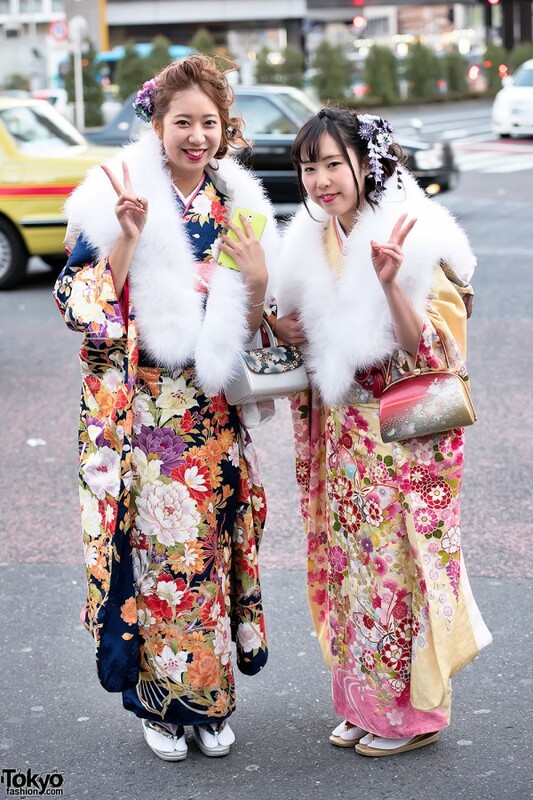 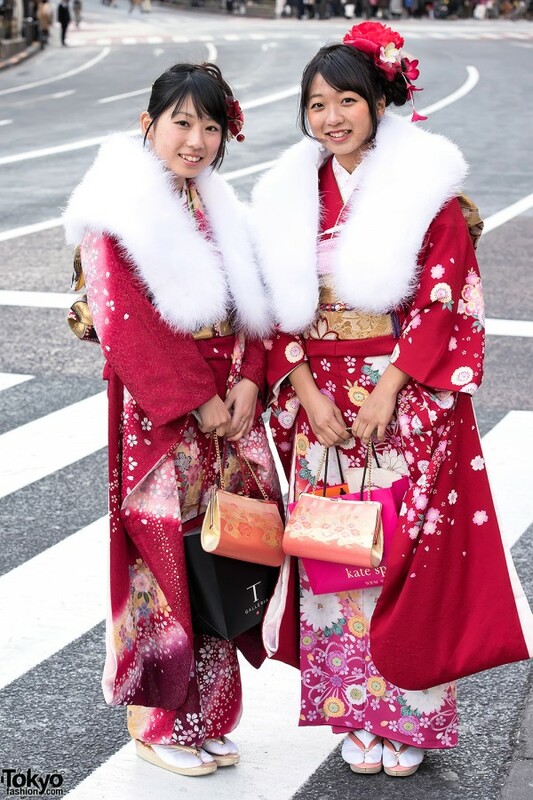 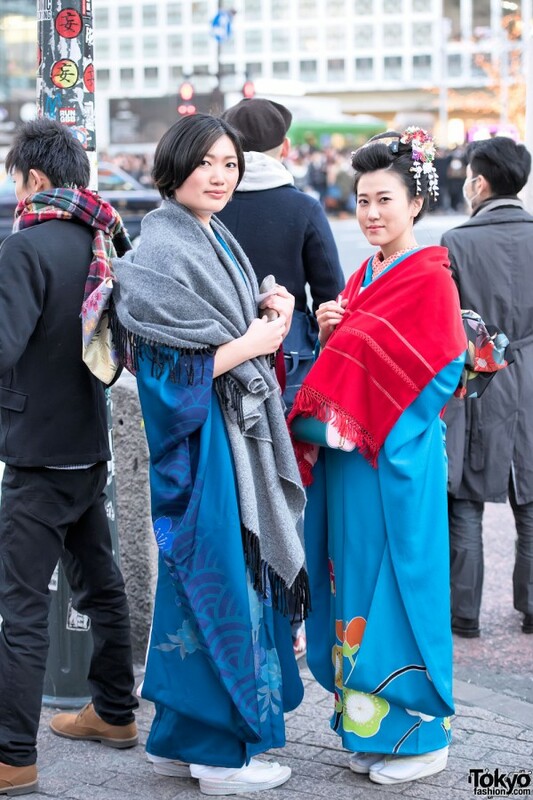 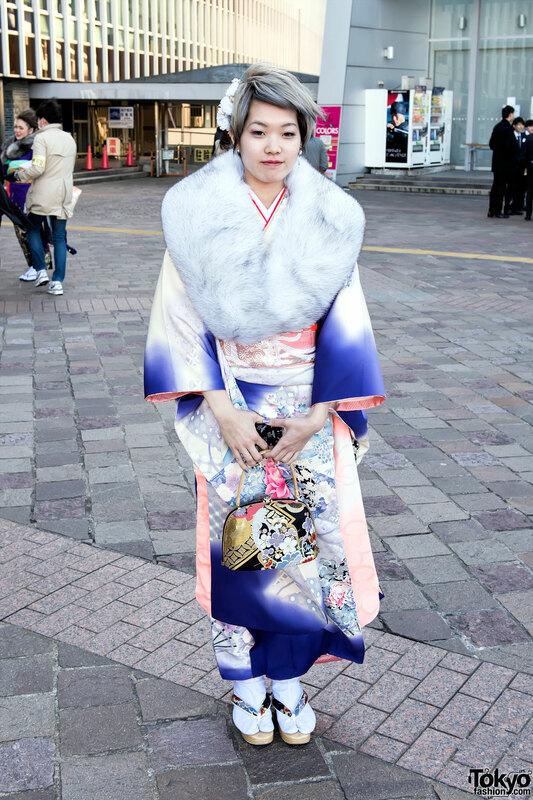 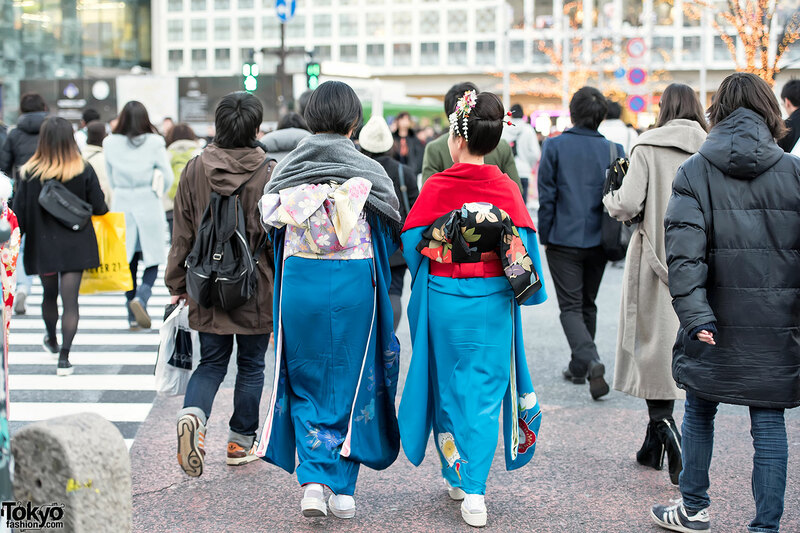 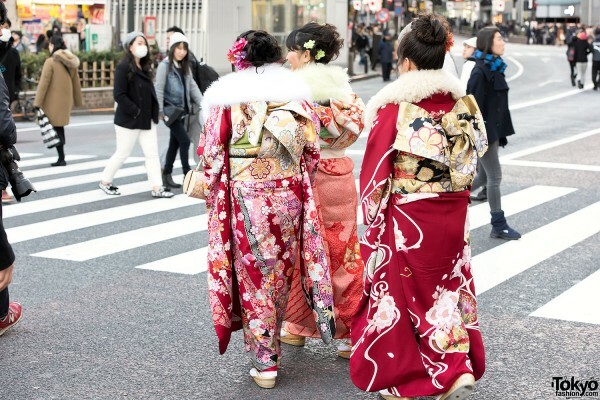 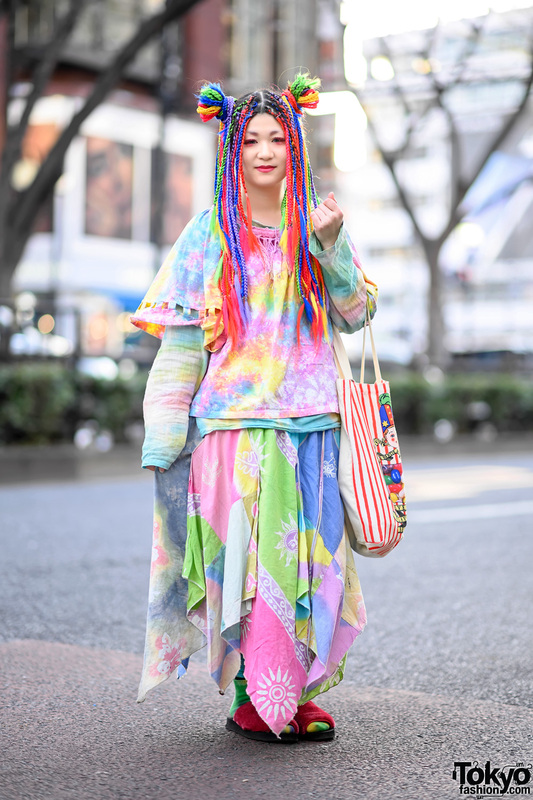 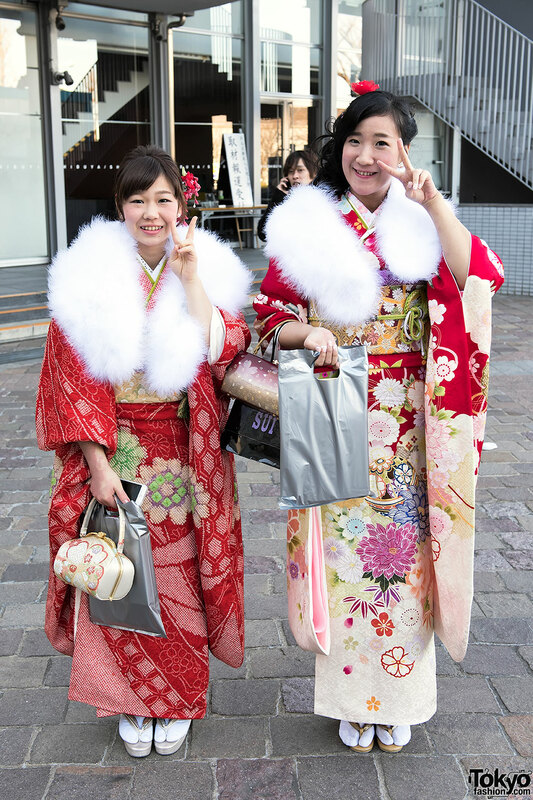 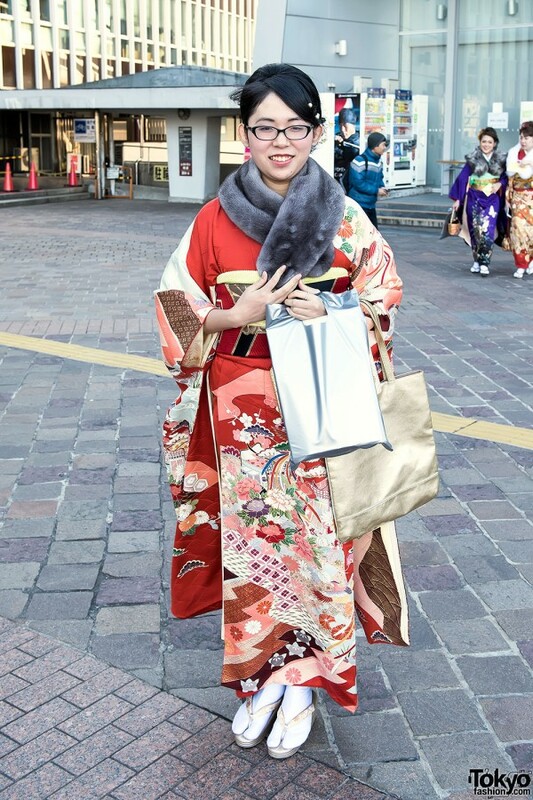 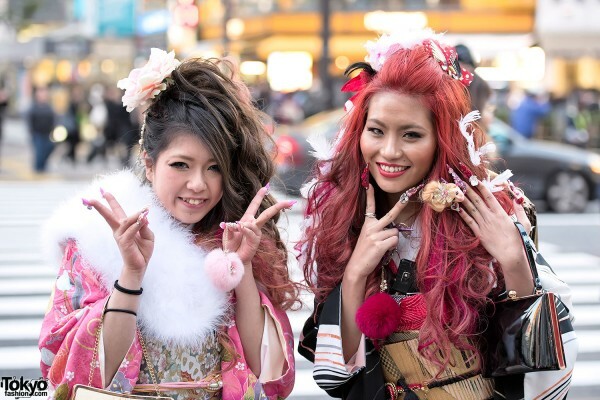 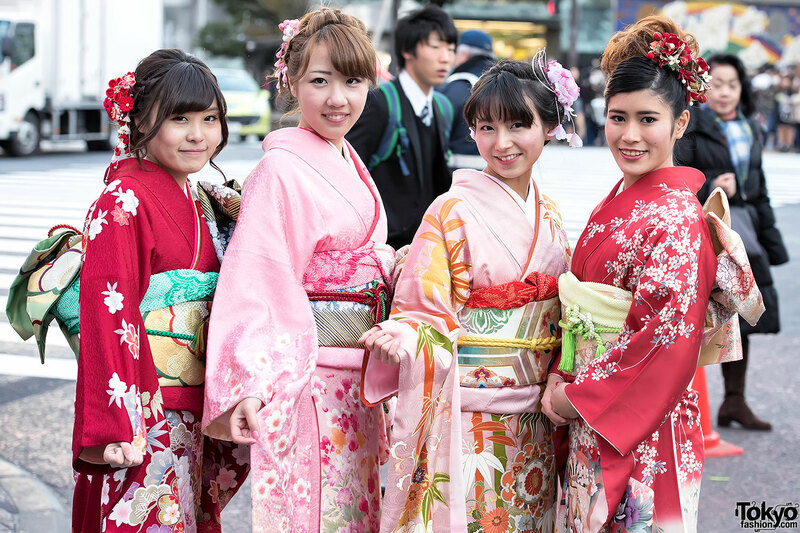 Fashion lovers are treated to the sight of young people in beautiful traditional clothing all over Shibuya. 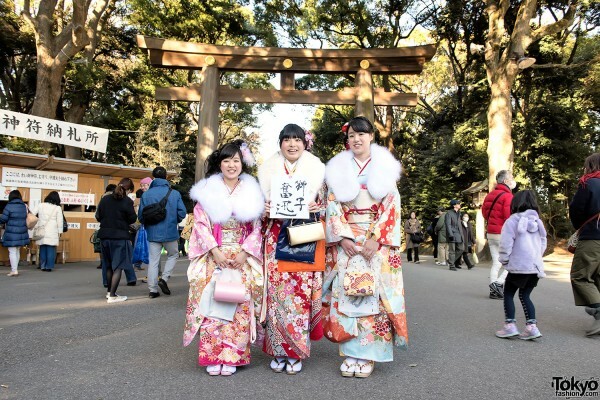 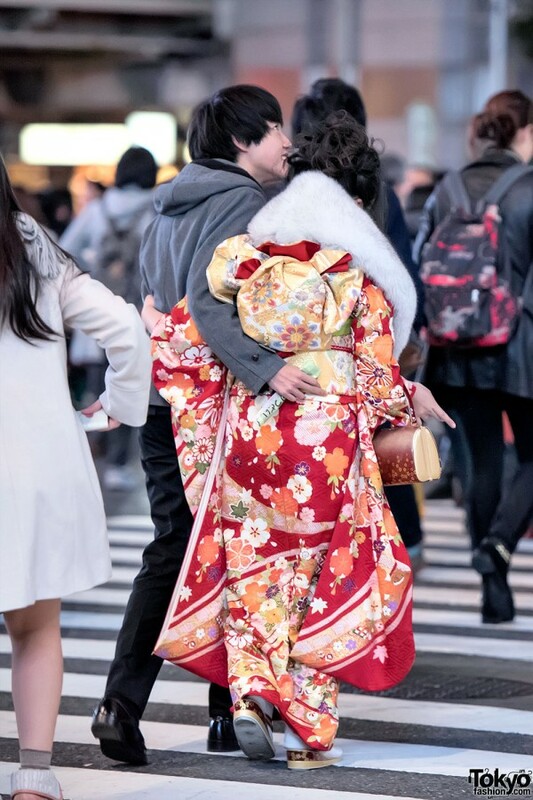 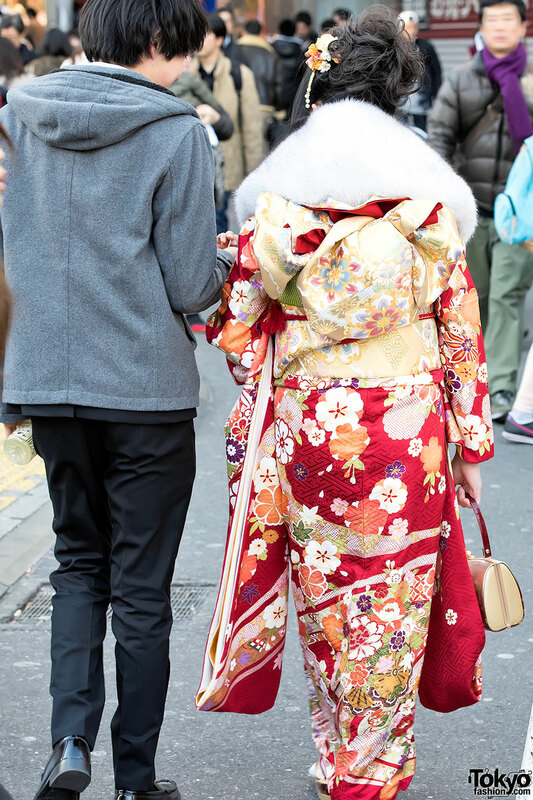 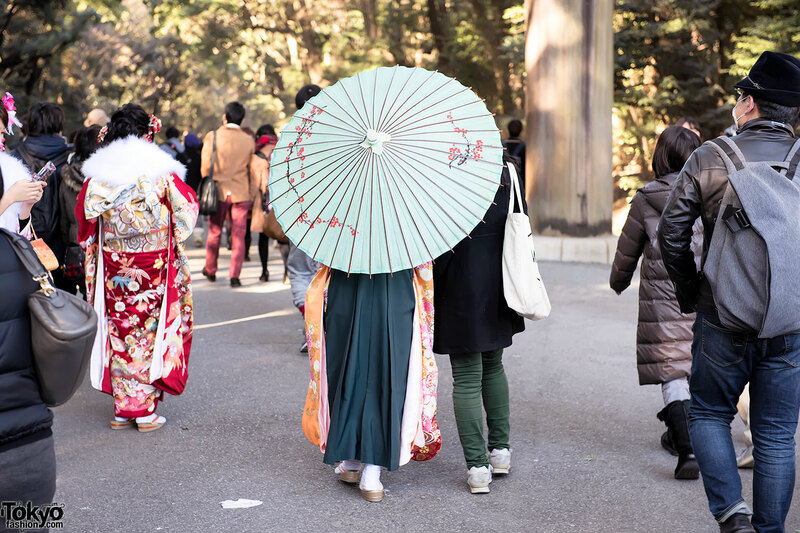 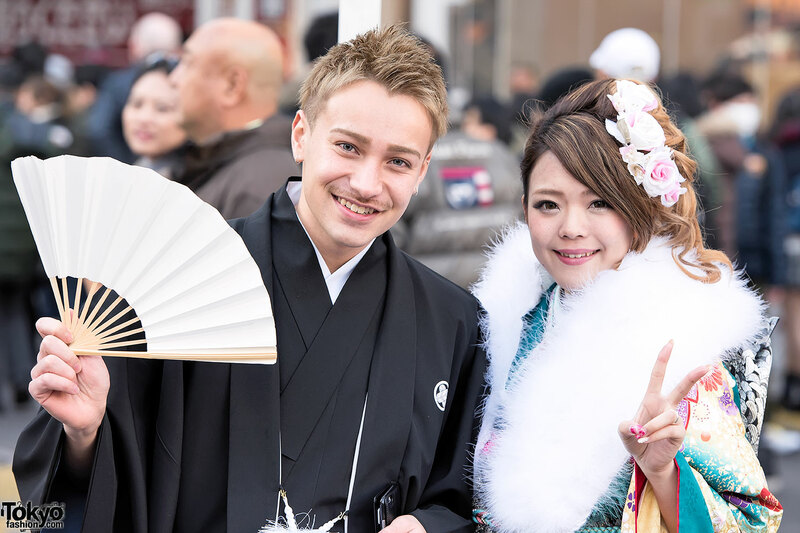 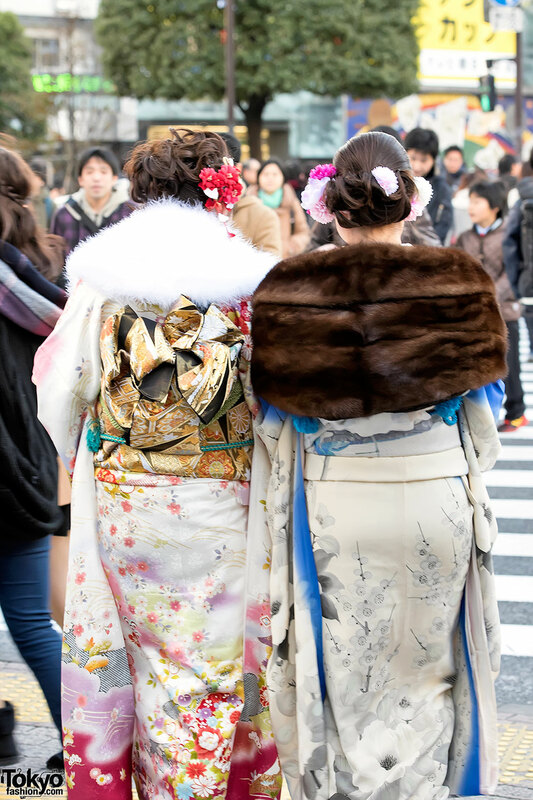 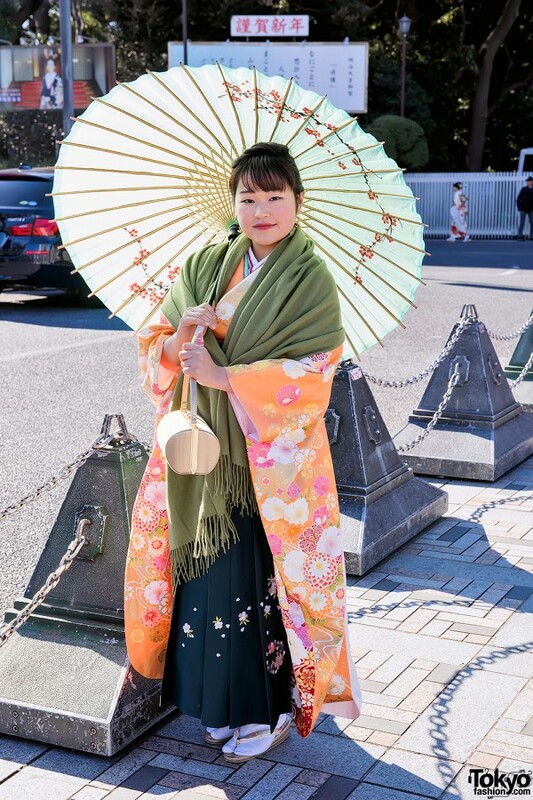 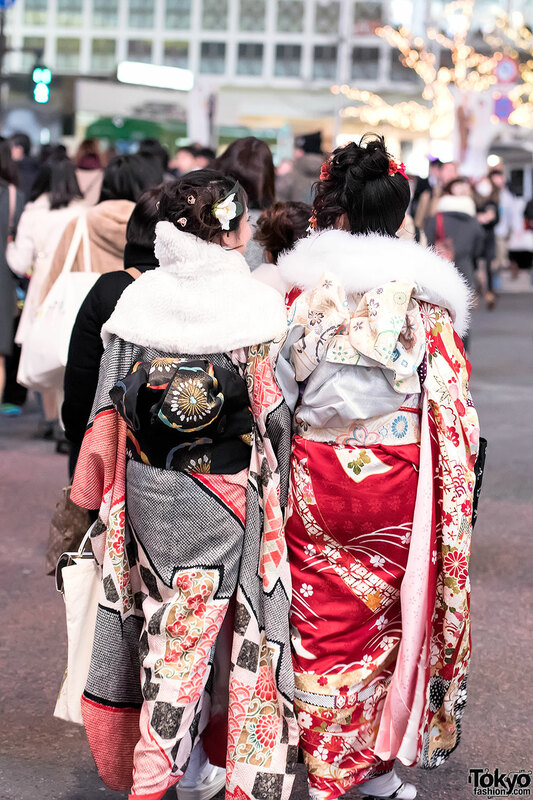 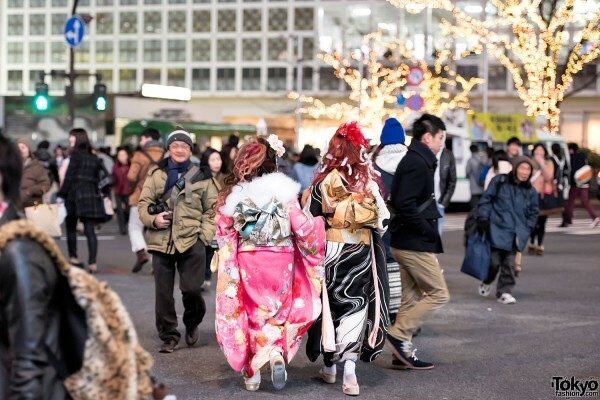 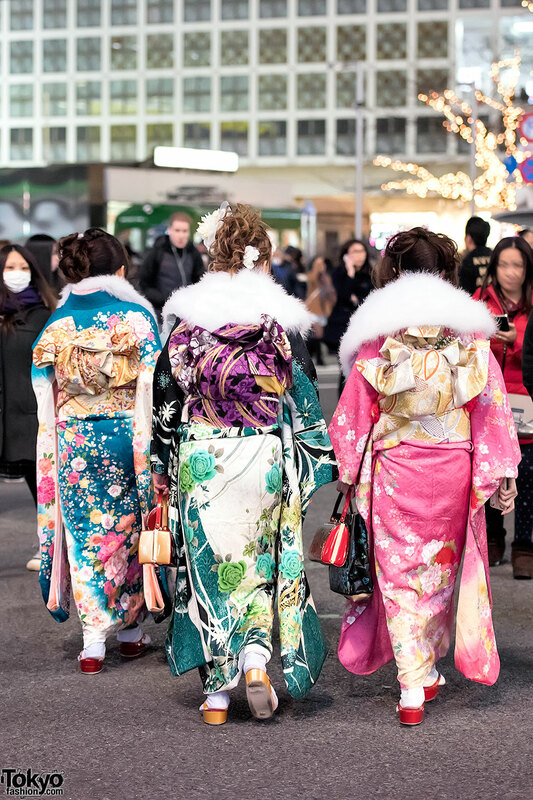 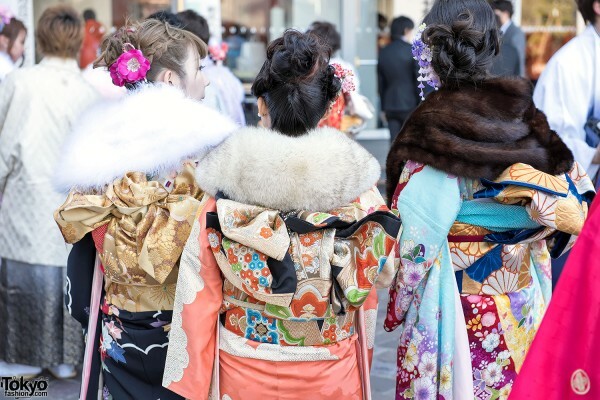 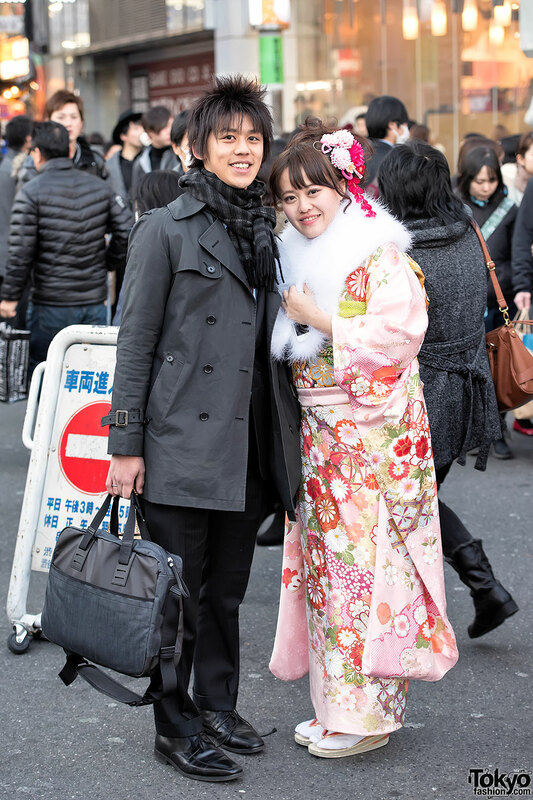 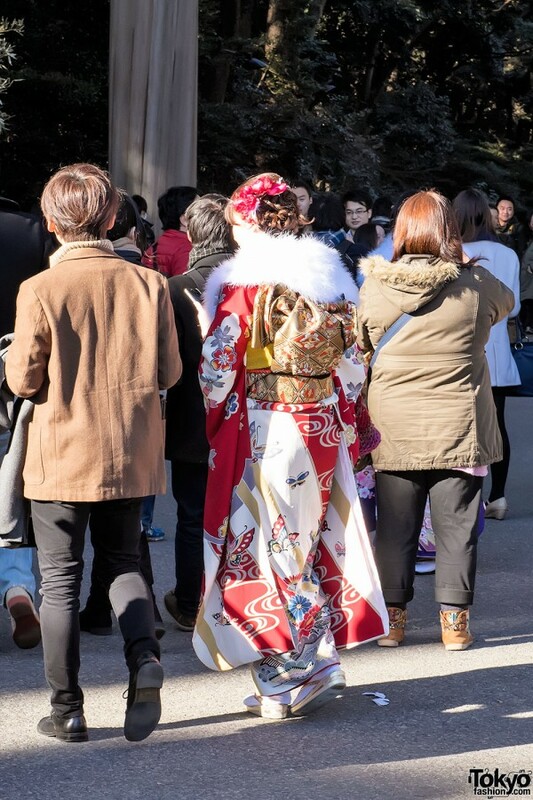 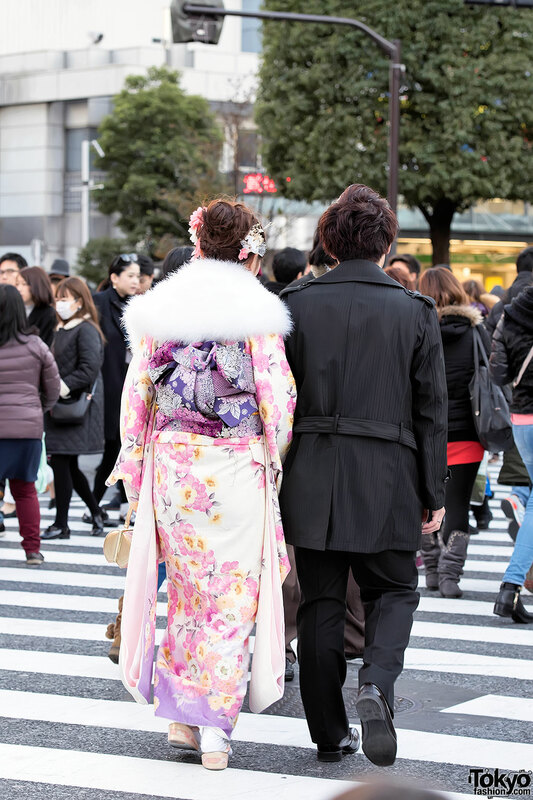 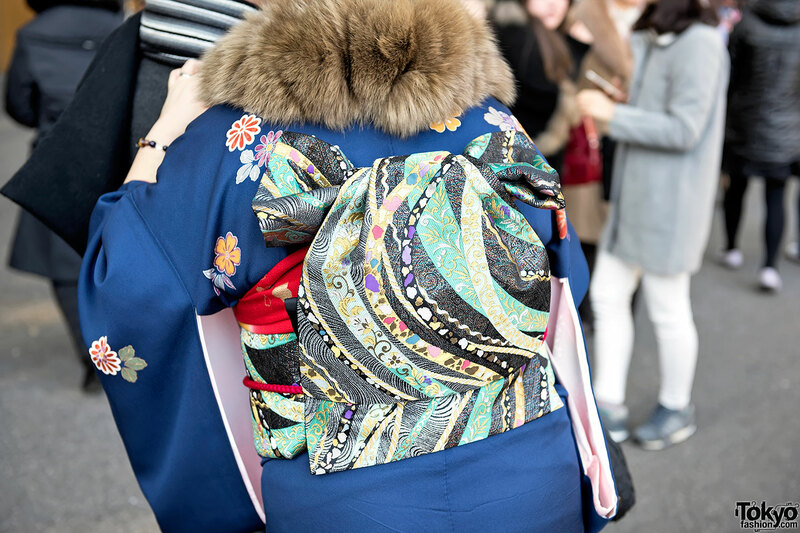 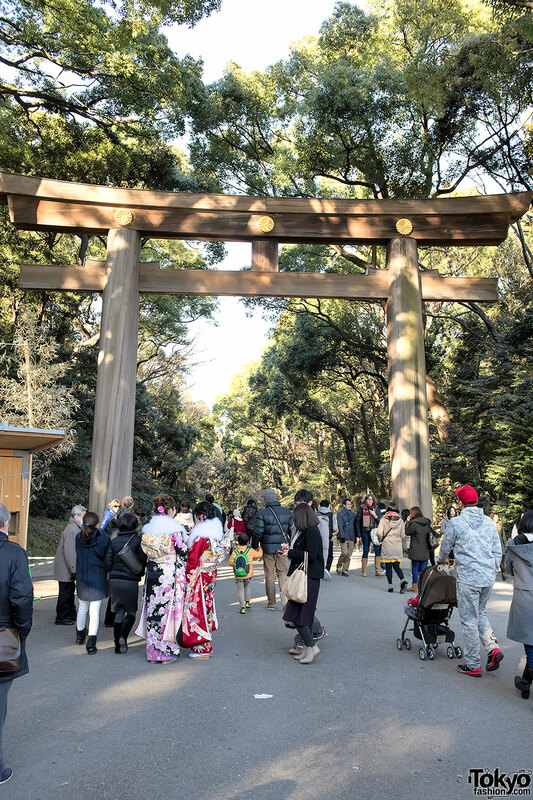 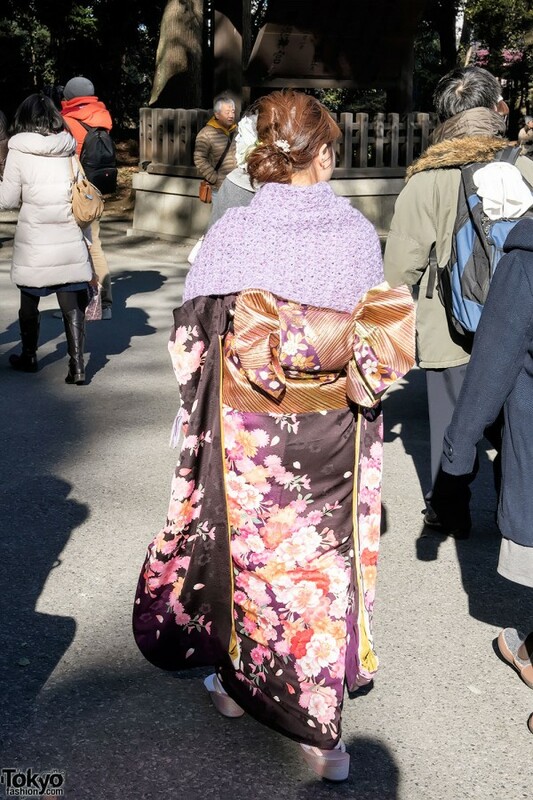 Every year, we snap pictures in Shibuya and at Meiji Shrine in Harajuku of the kimono and hakama to share with those of you who may not have the chance to see these outfits in person. Please enjoy these 150+ pictures from Seijin no Hi 2015. 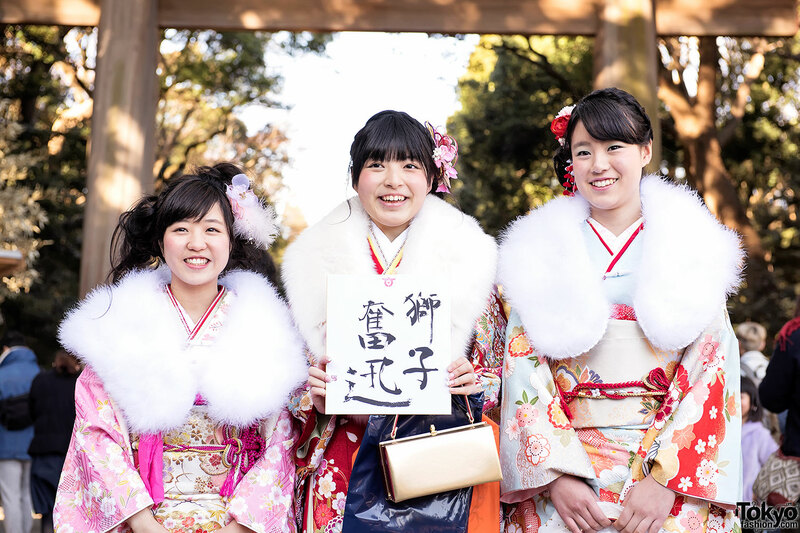 We hope to see you in Japan on a future Coming of Age Day! 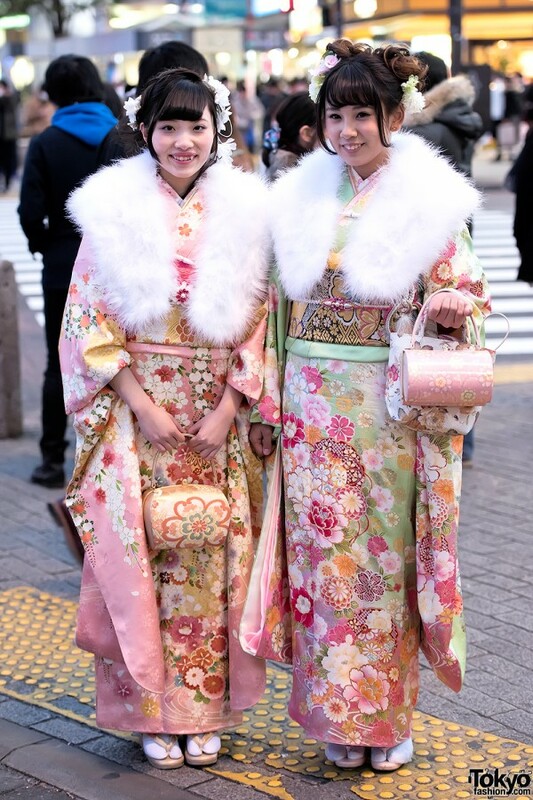 Beautiful shots and wonderful clothes indeed ! 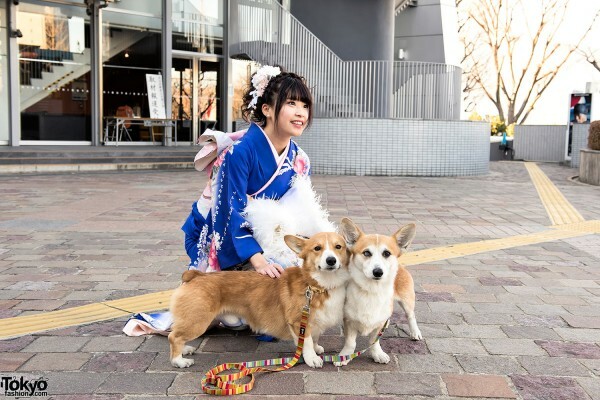 They all are so lovely ! 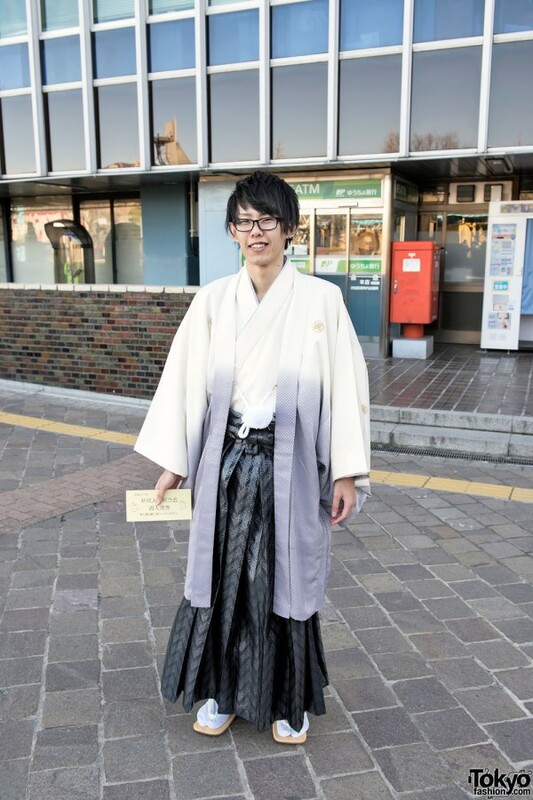 Although I’m south american I love jap culture so much and back a year ago I so wished to have celebrated my 20th birthday with a Seiji no Hi theme so I could wear a lovely furisode too and I’m sure it would have been so fun and memorable but sadly I couldn’t （；へ：）never it’s too late though! 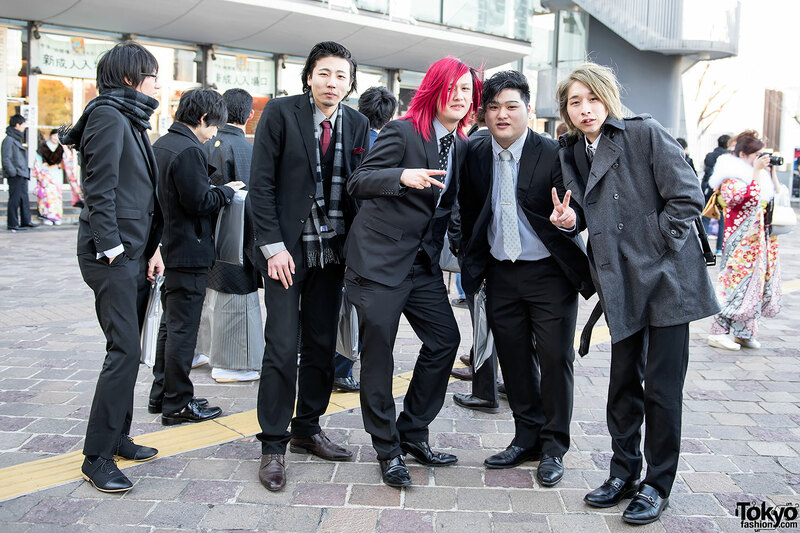 Anyways, thank you so much for the lovely photos ! ! 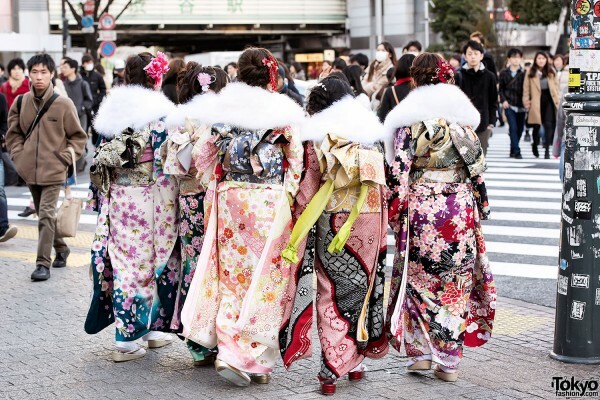 I love Japanese culture and I’m African American. 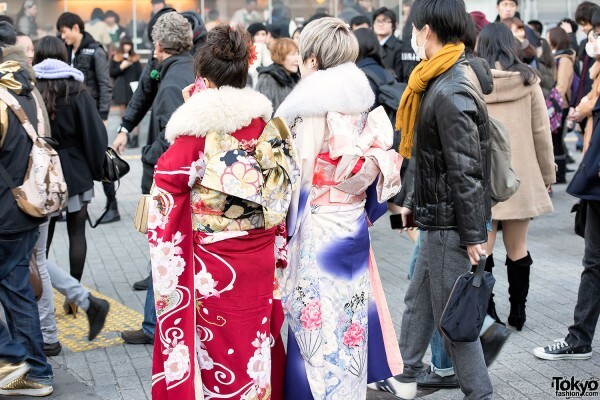 I hope that when come of age I will be able to celebrate it in Japan just like them *^^* It’s so beautiful!! Ah… you are all beautiful..
and arigato for posting those photos.